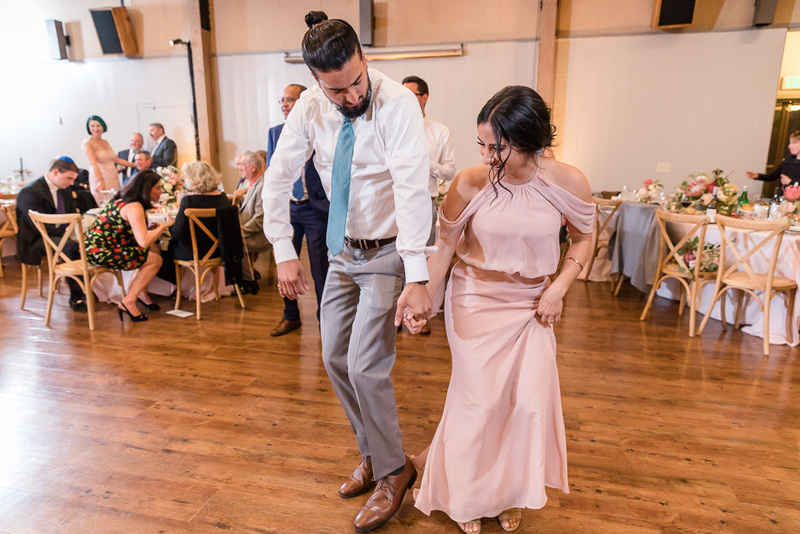 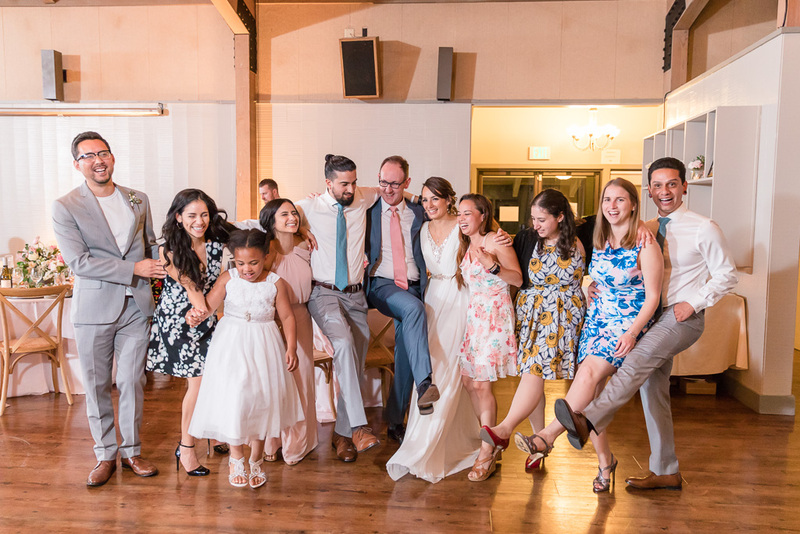 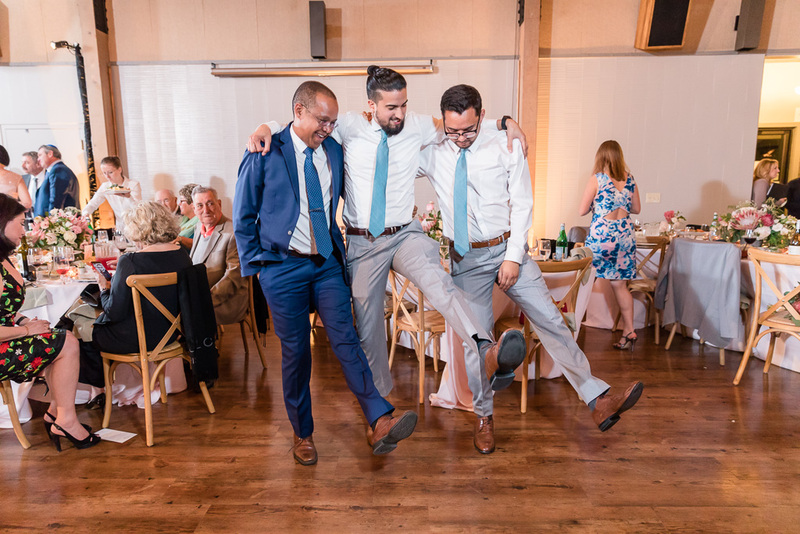 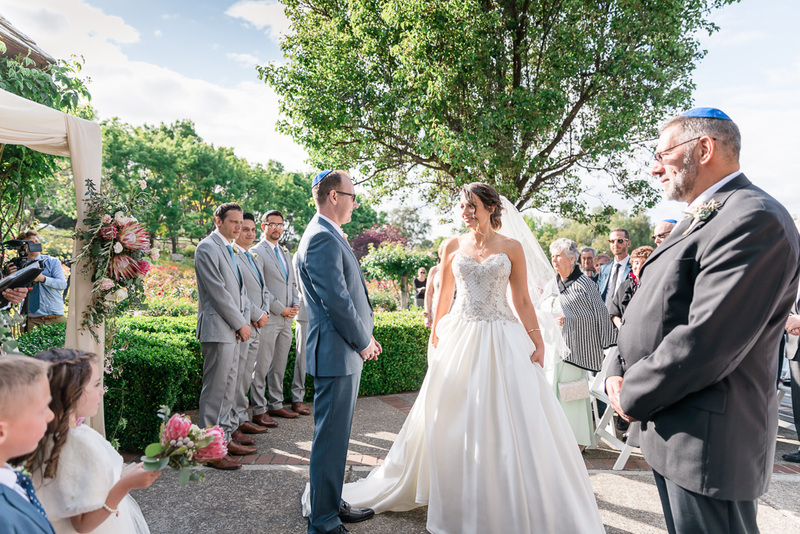 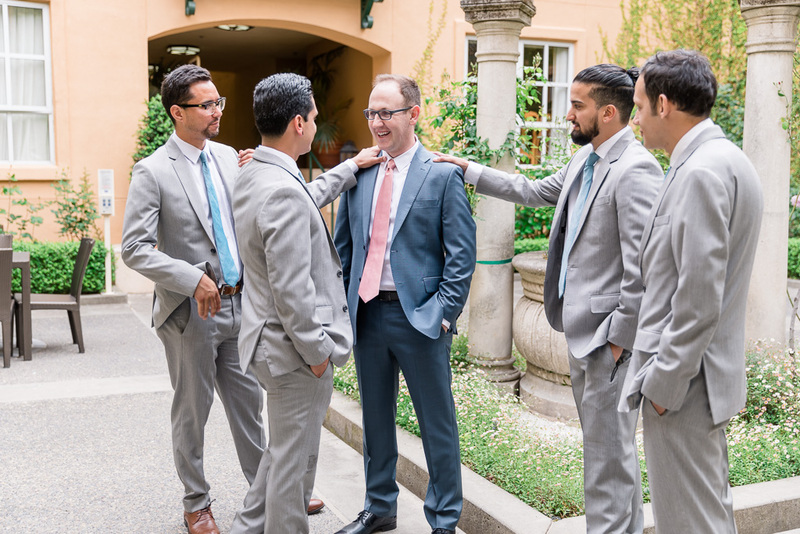 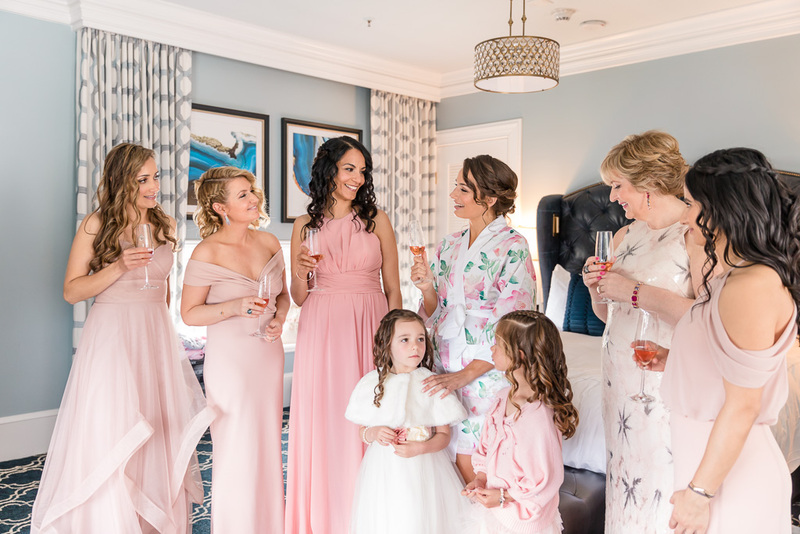 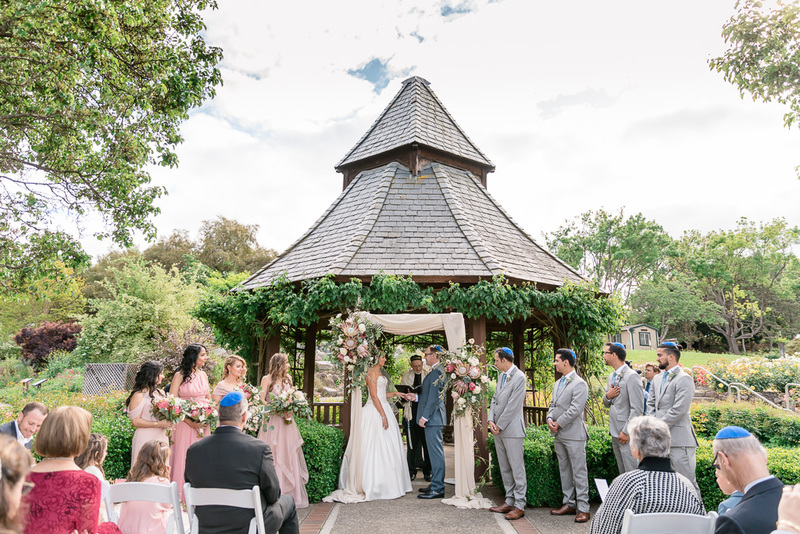 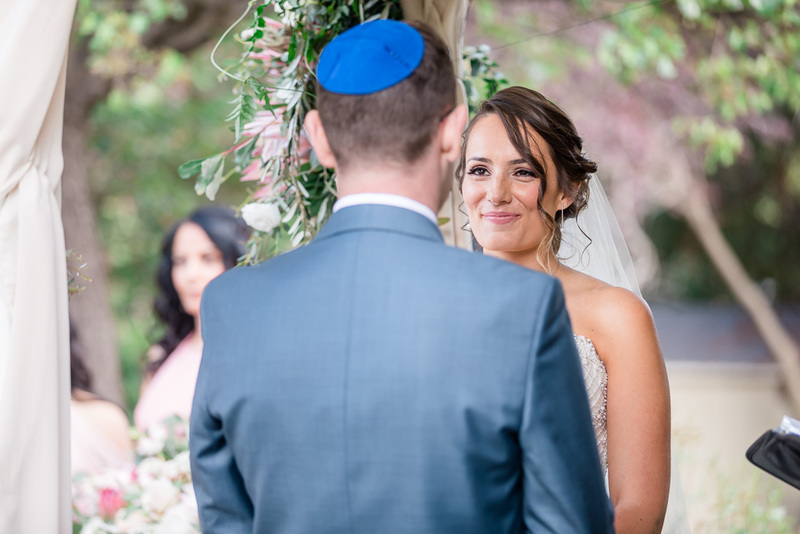 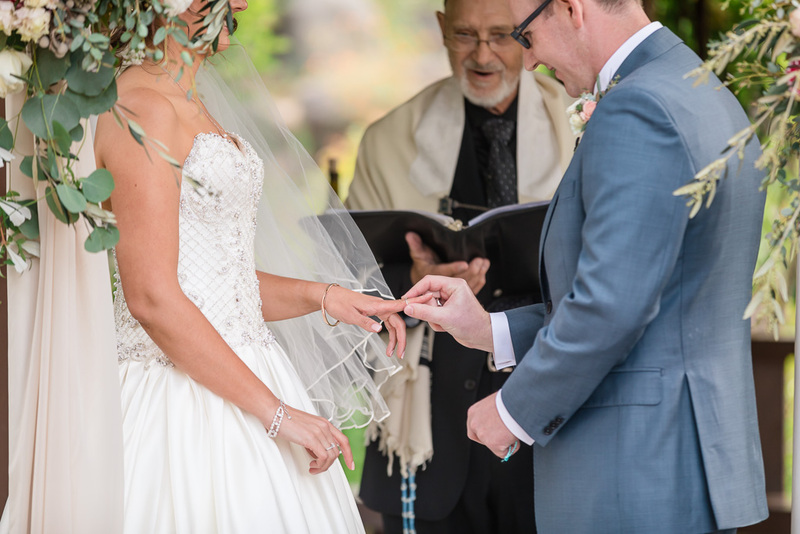 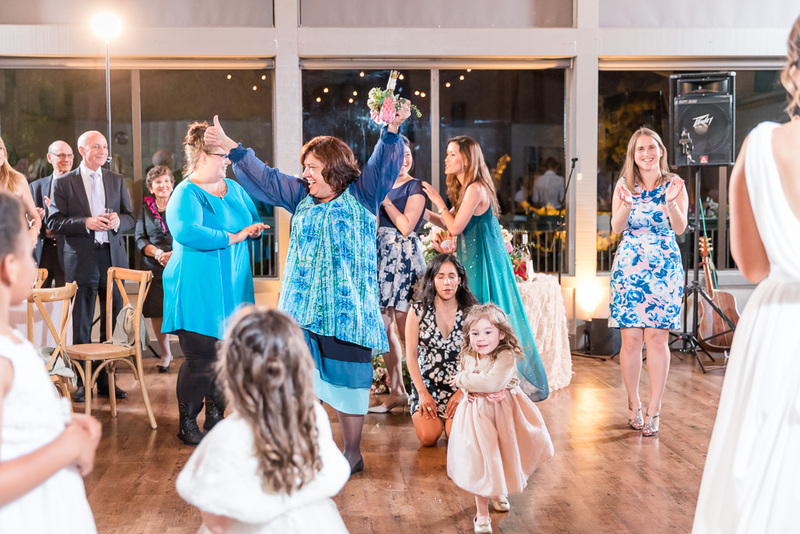 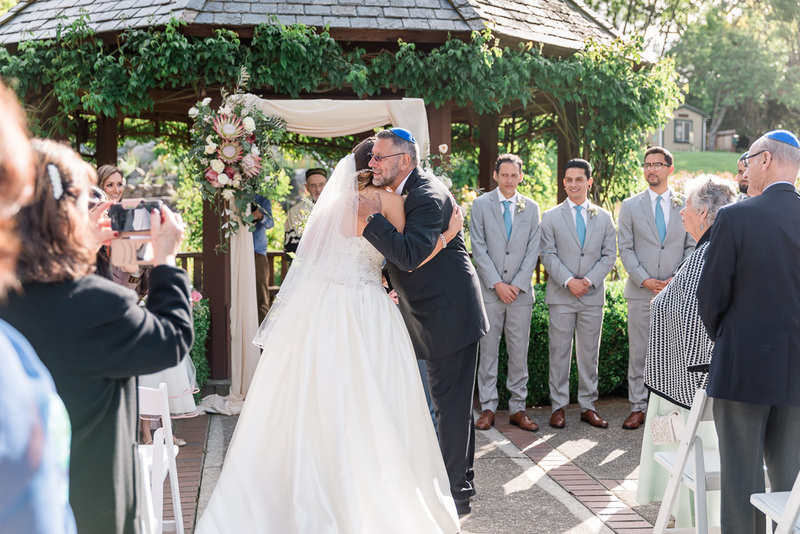 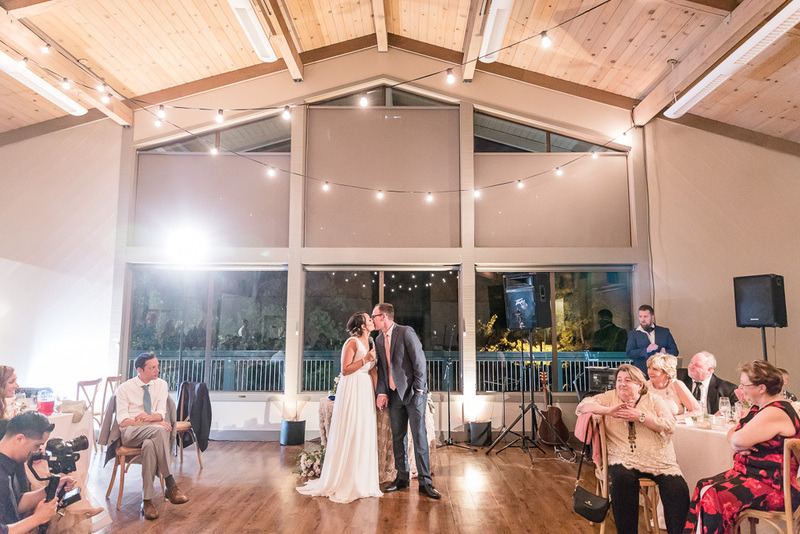 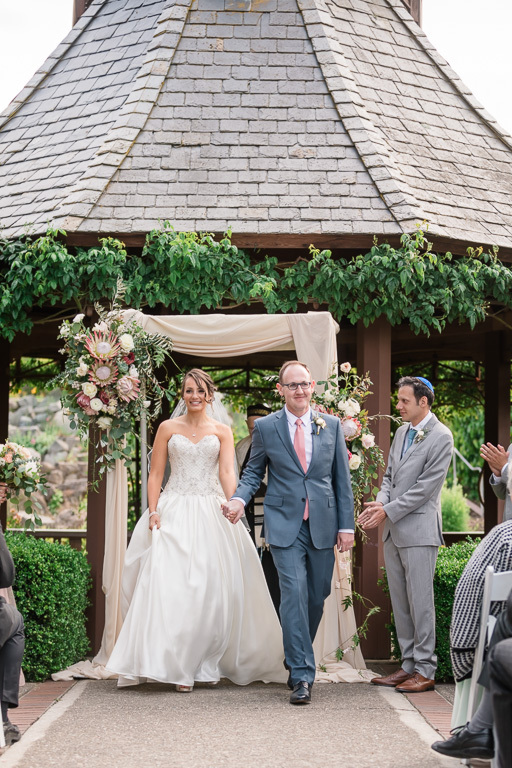 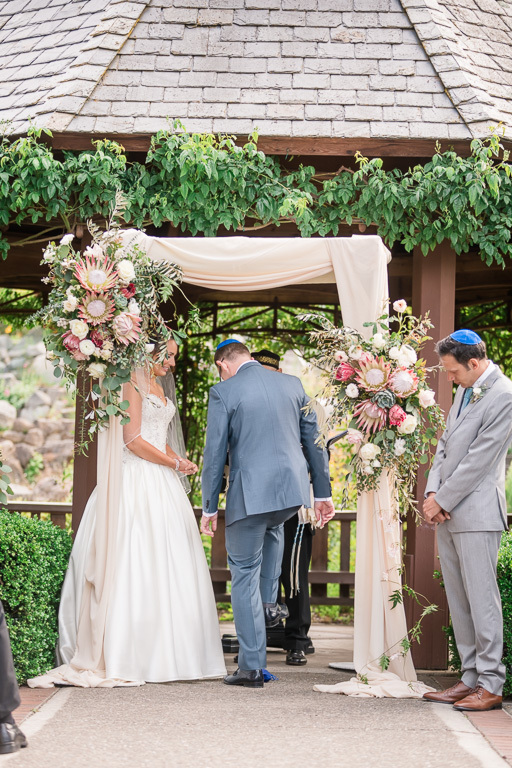 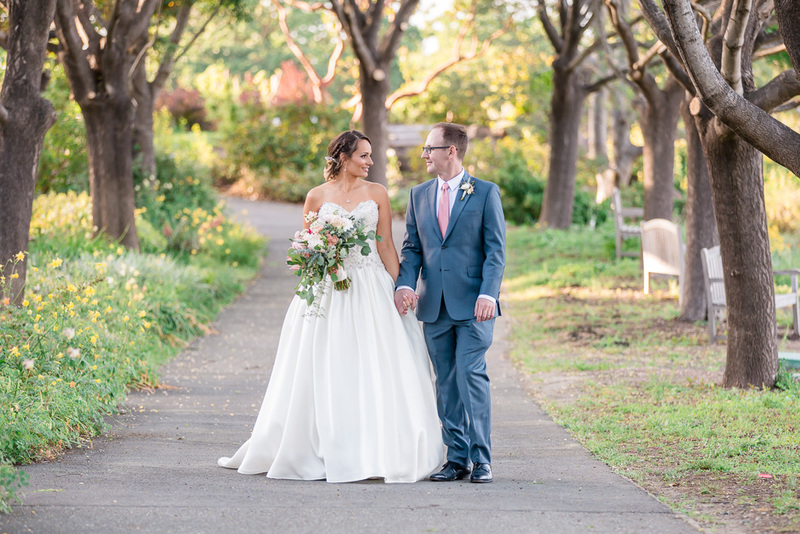 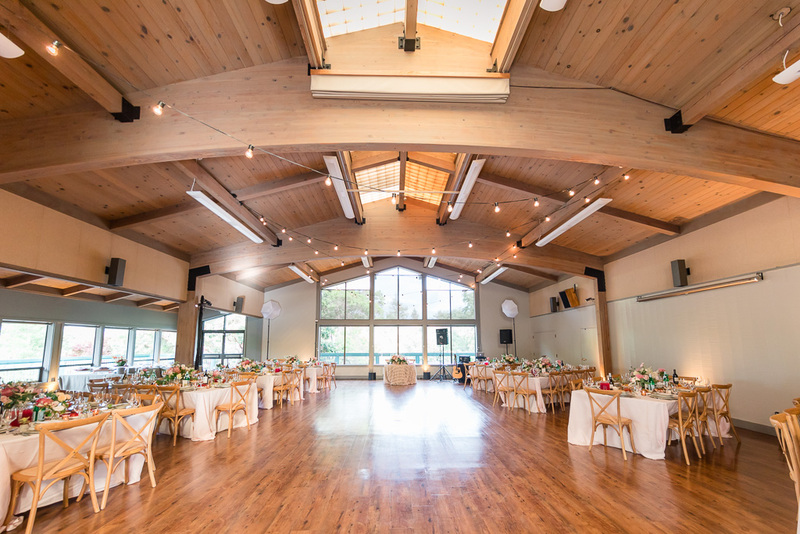 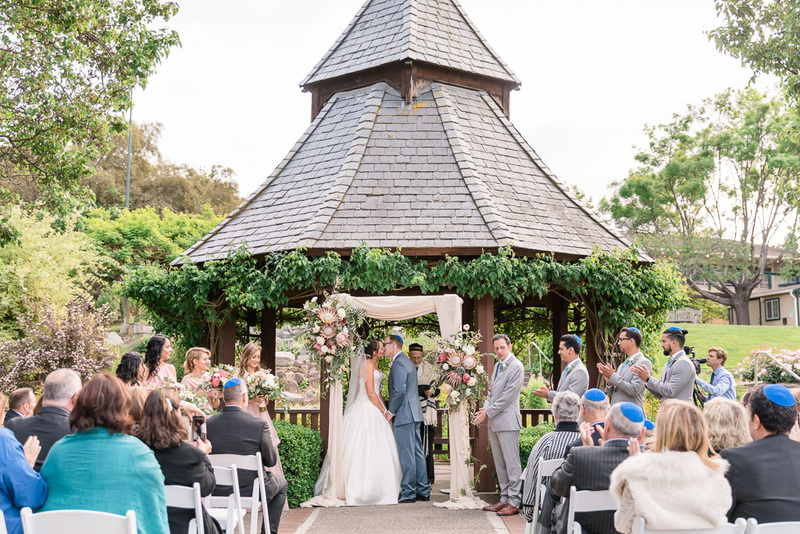 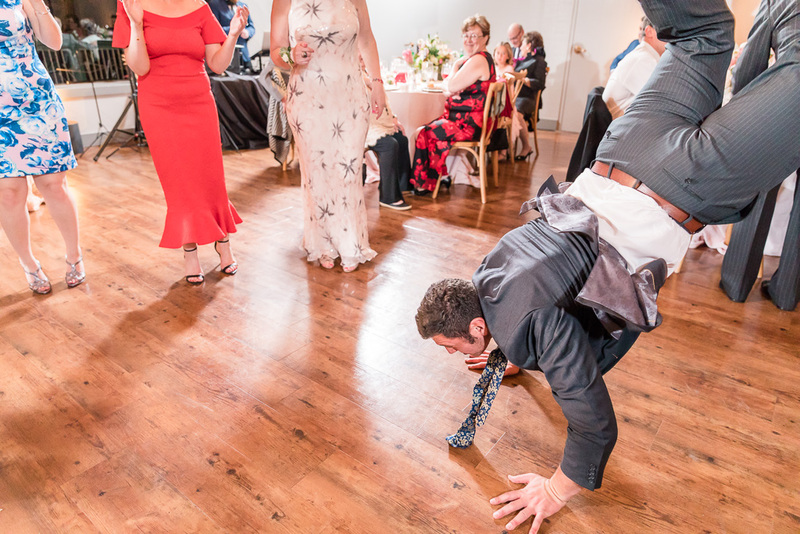 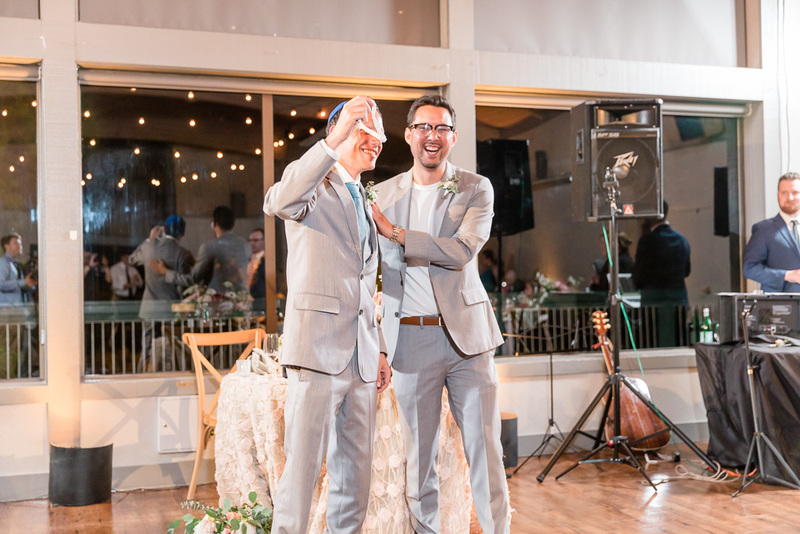 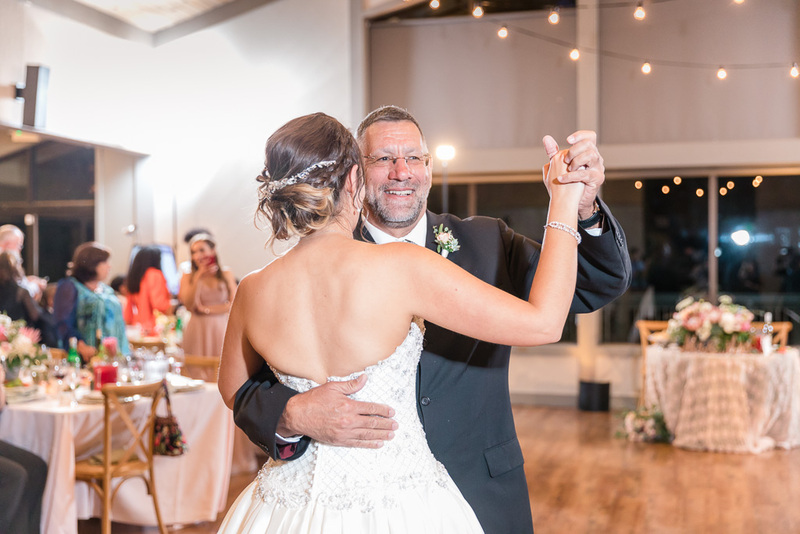 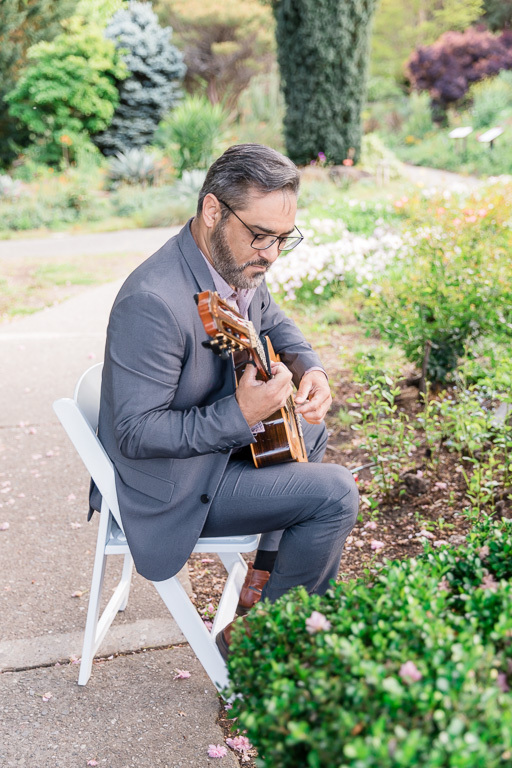 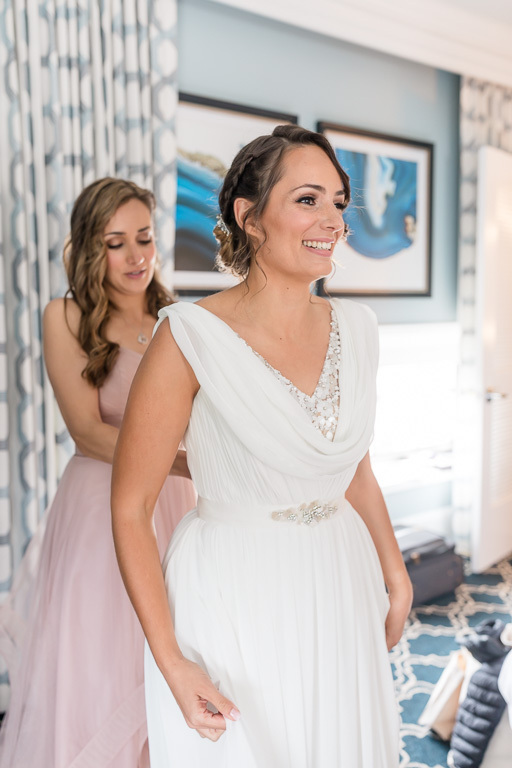 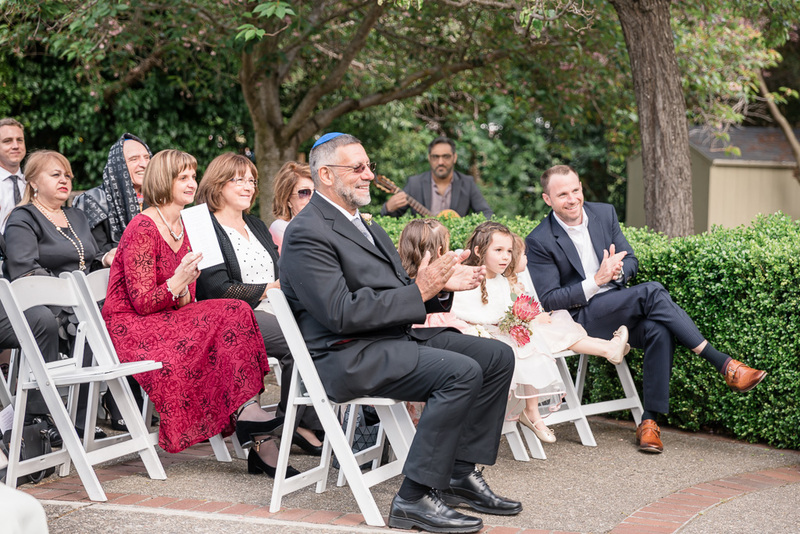 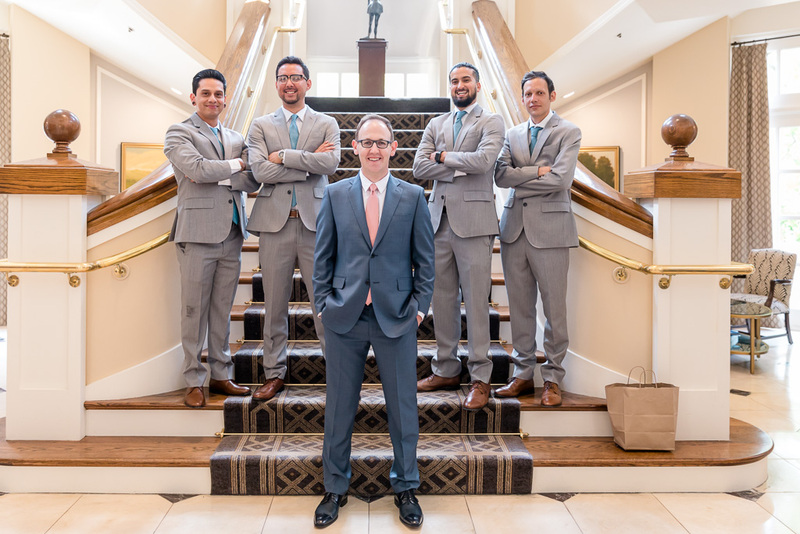 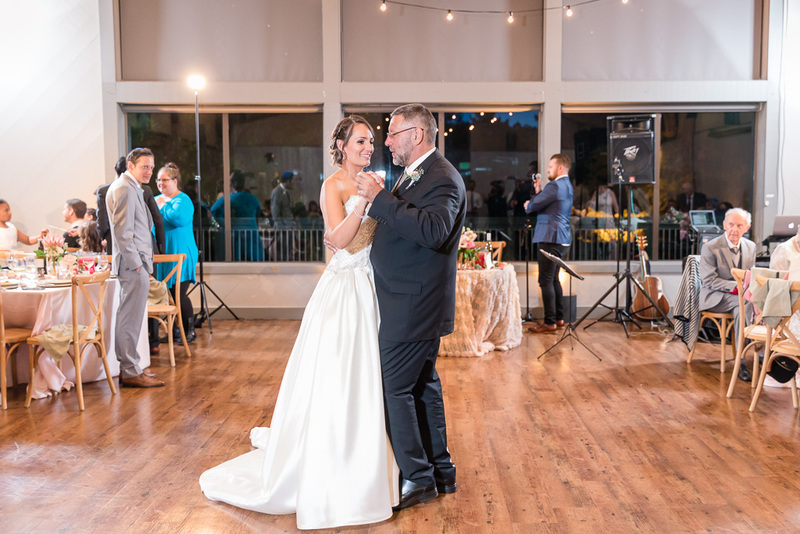 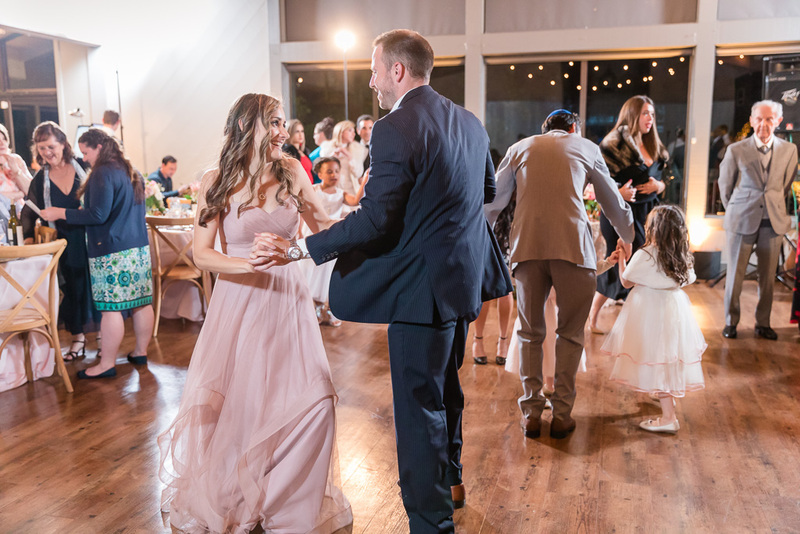 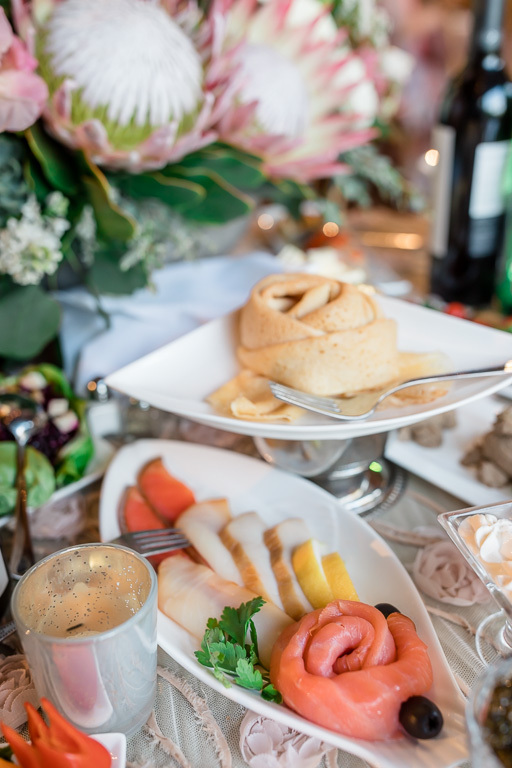 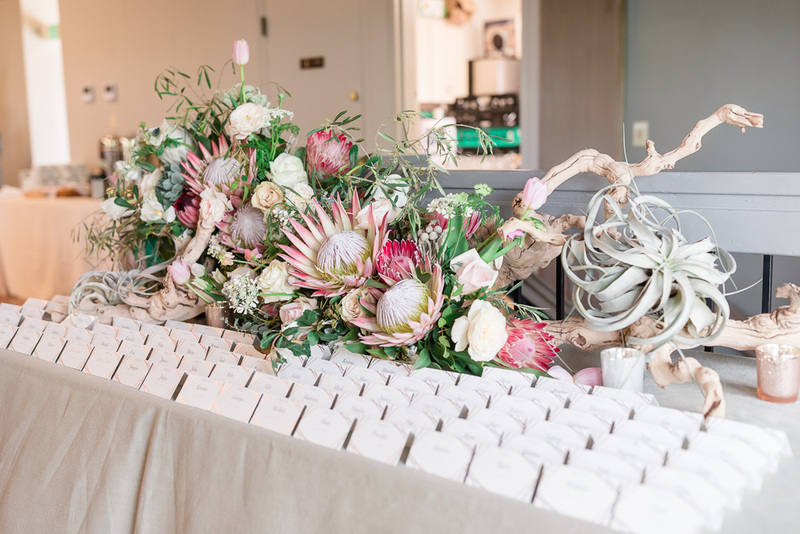 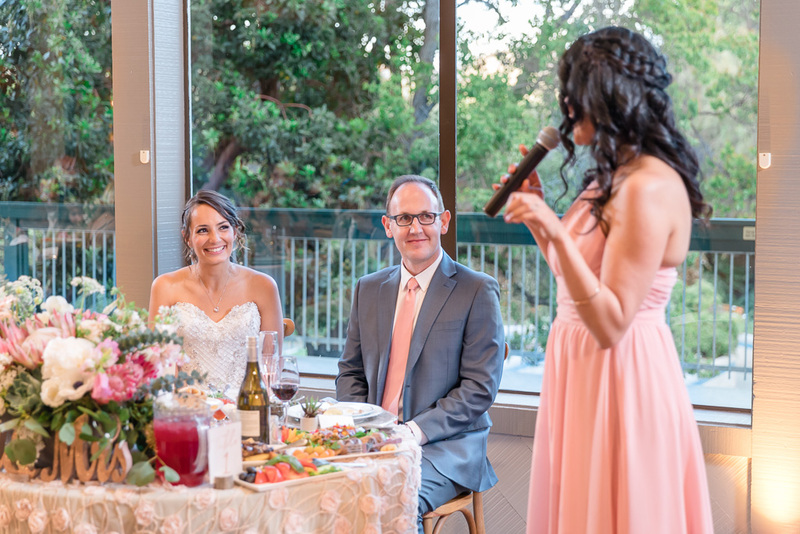 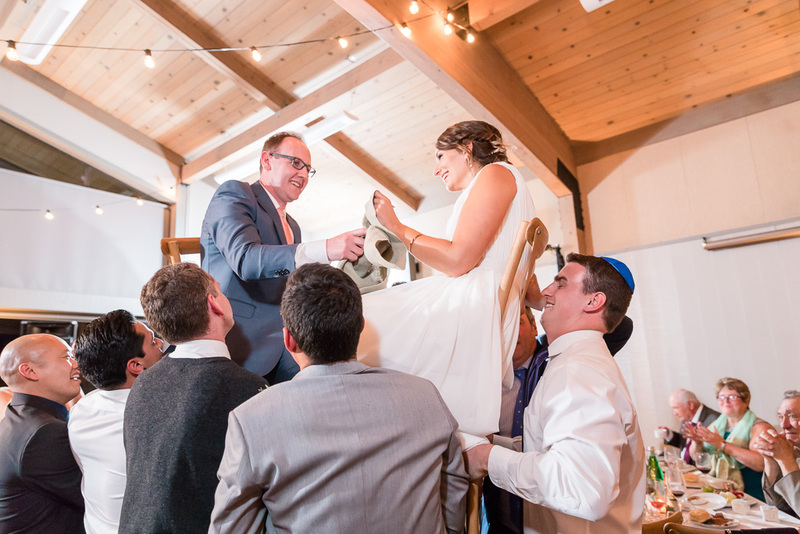 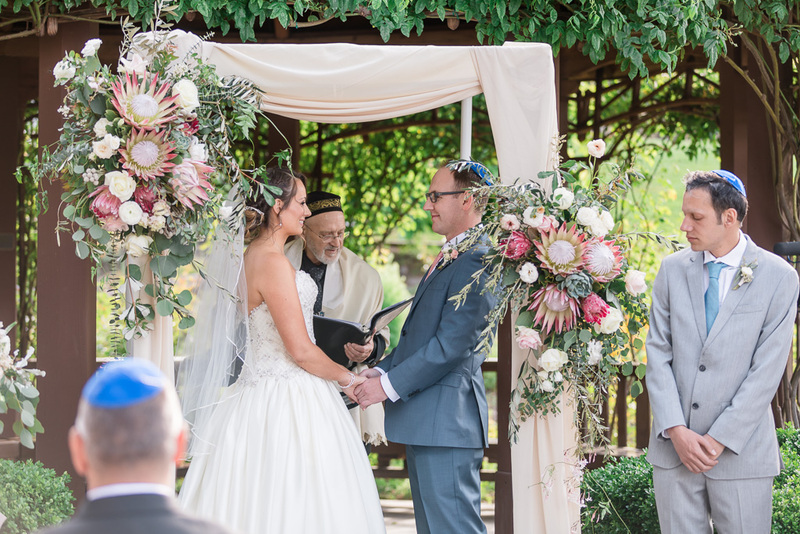 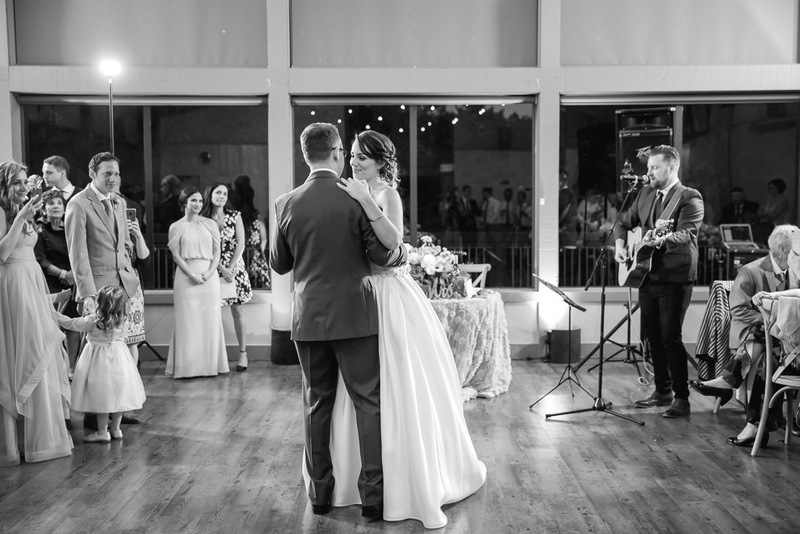 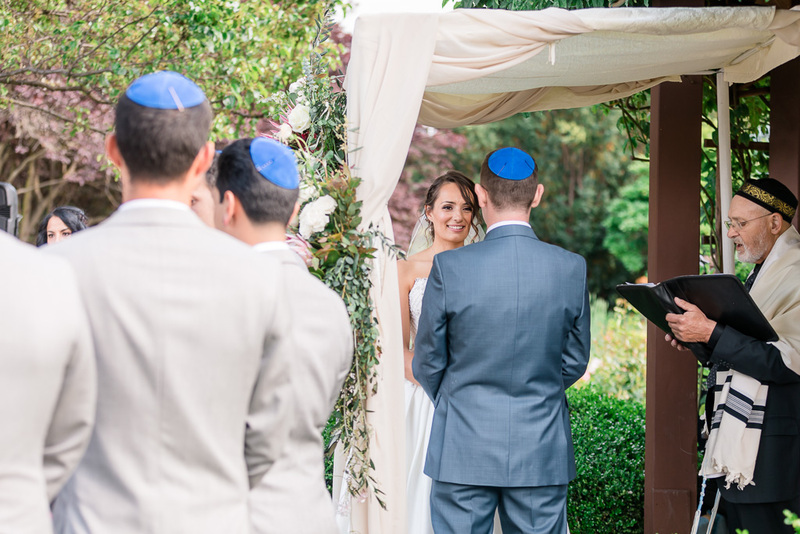 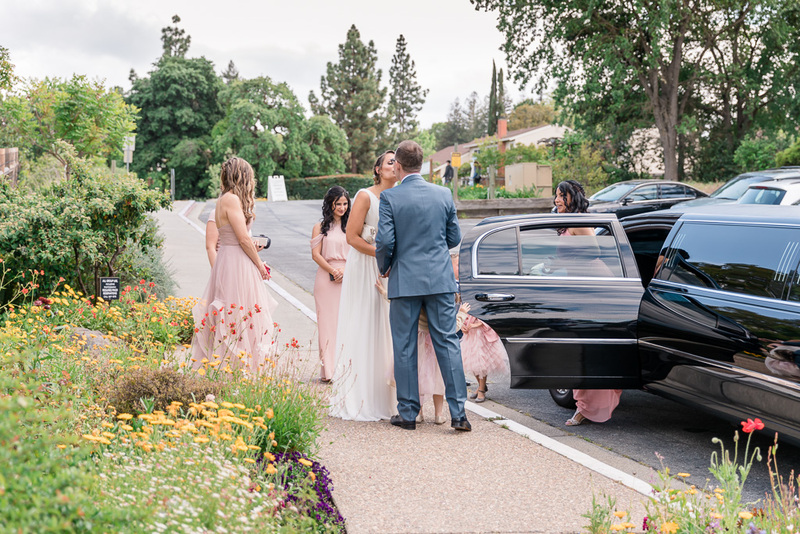 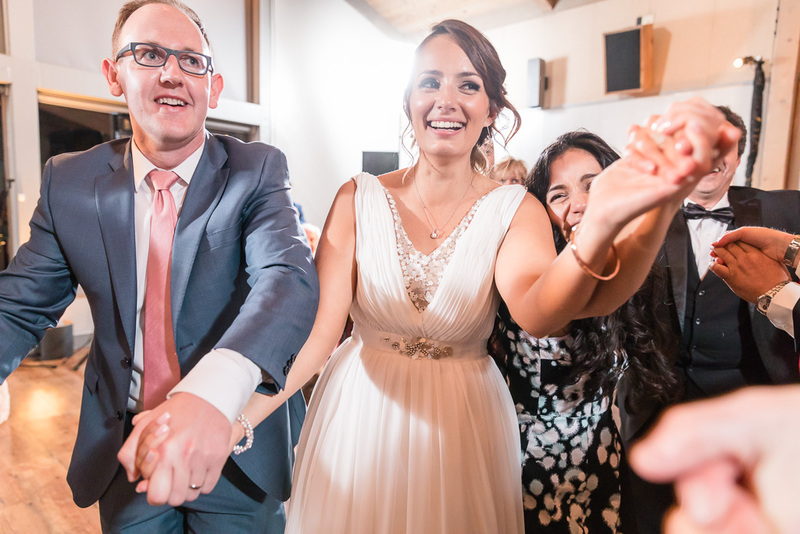 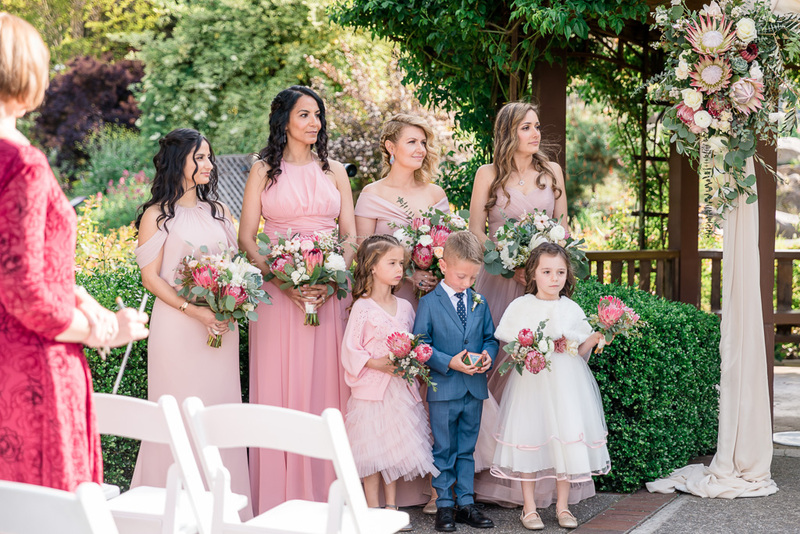 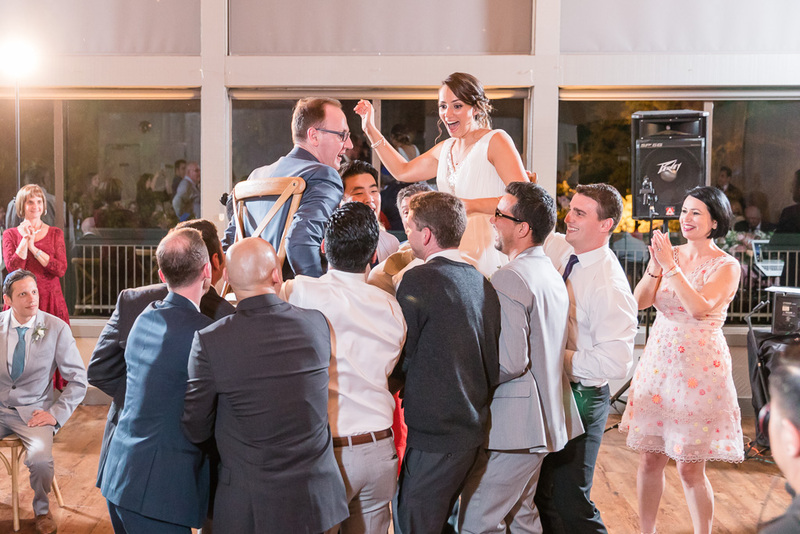 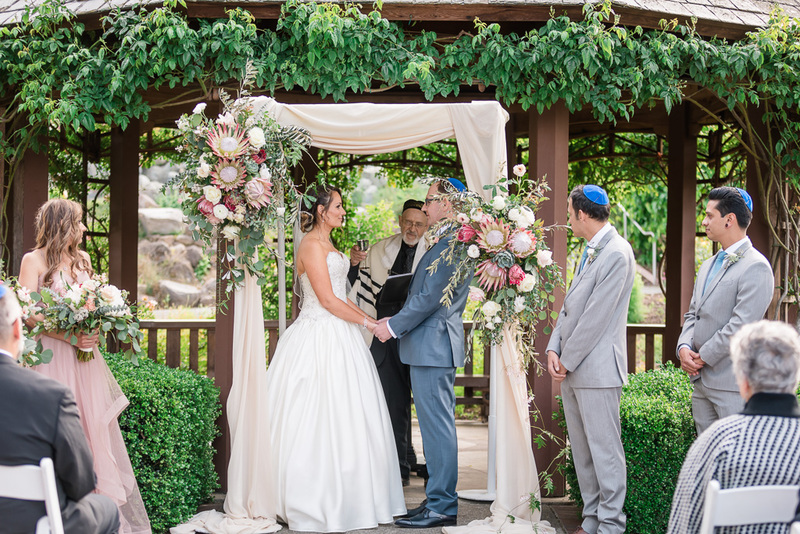 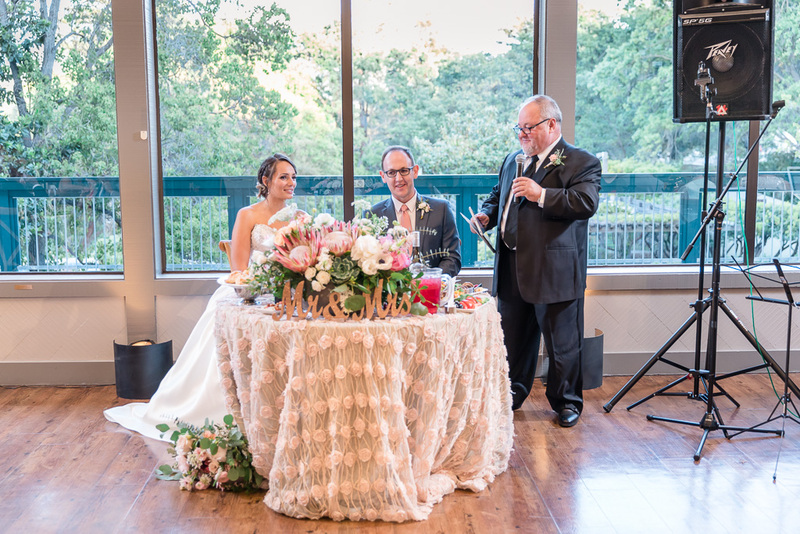 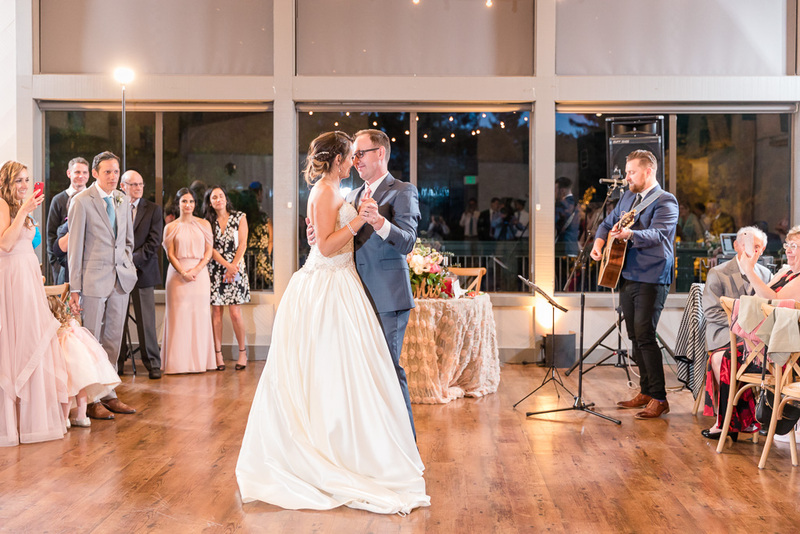 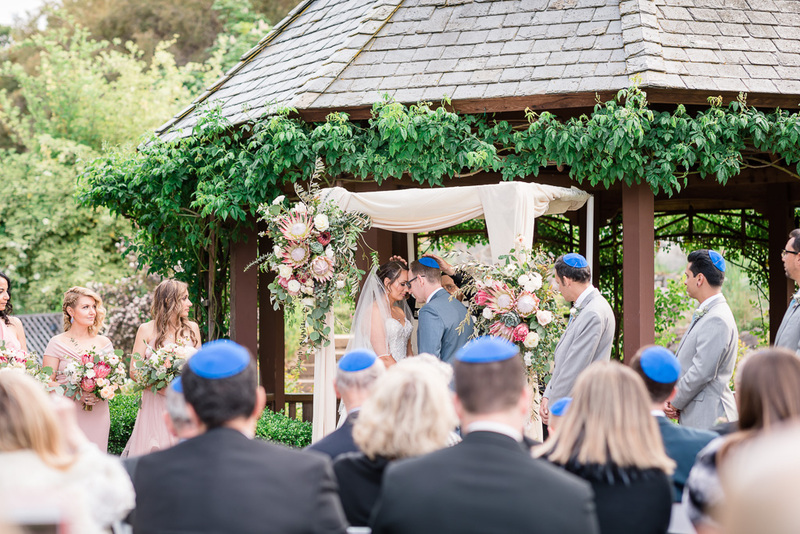 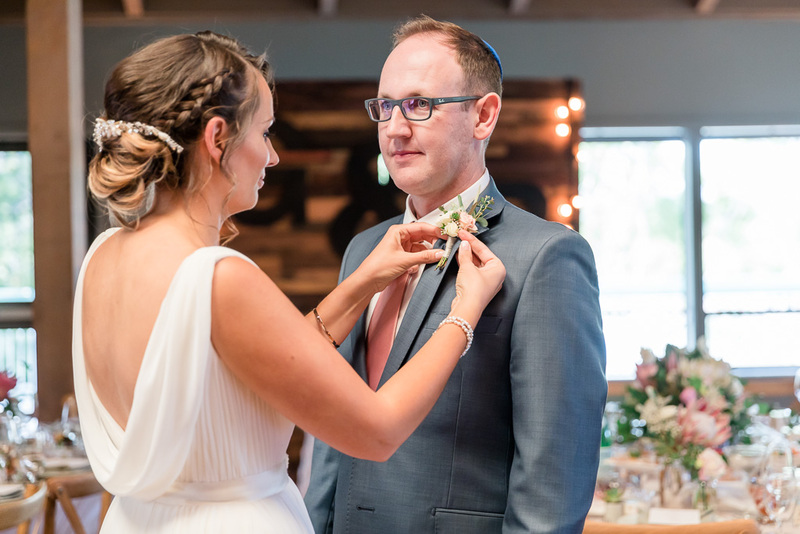 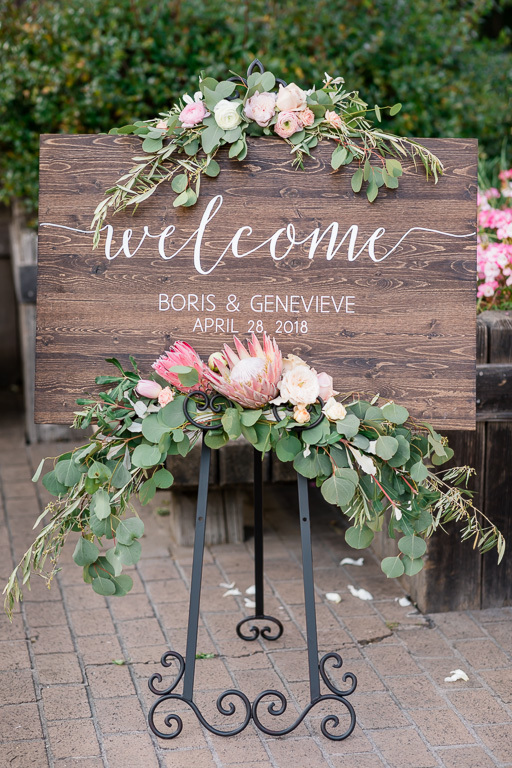 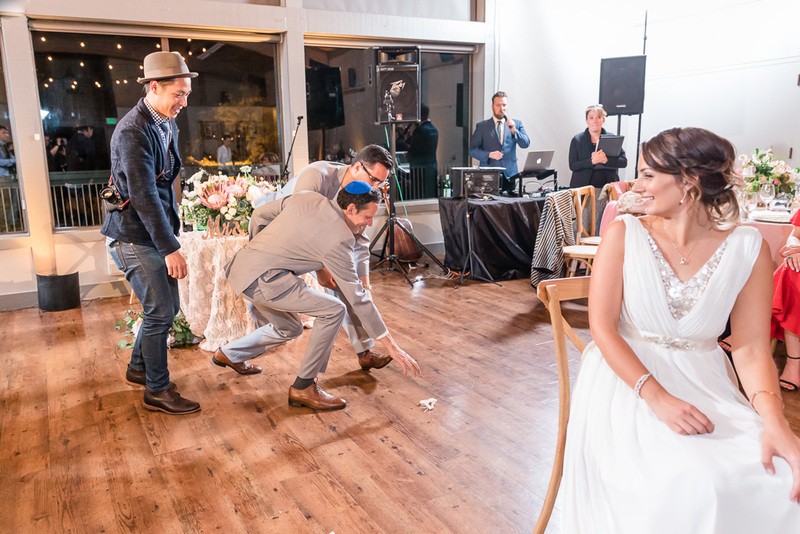 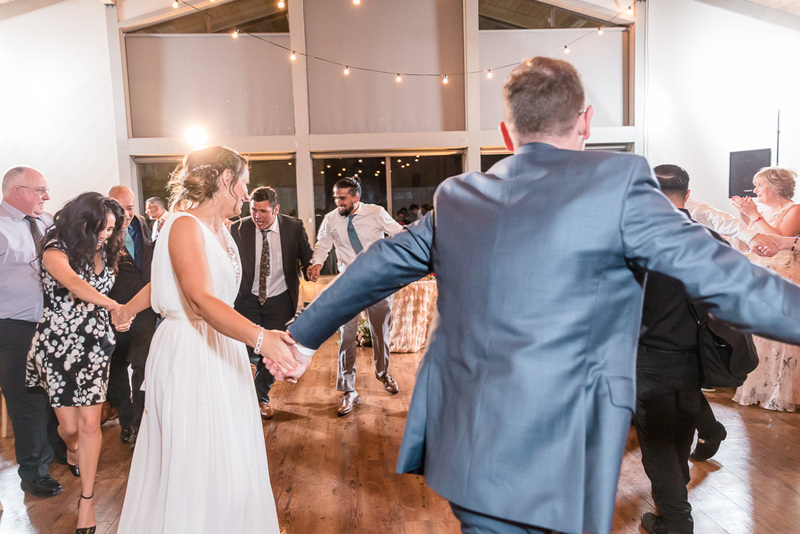 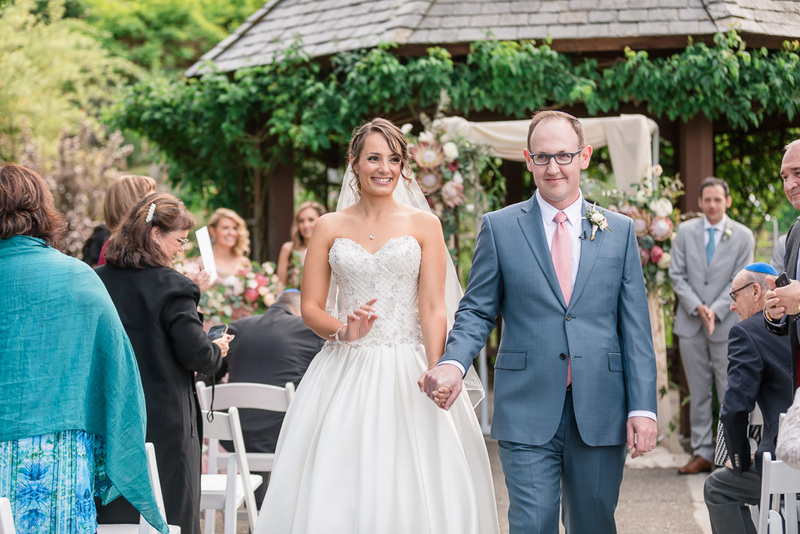 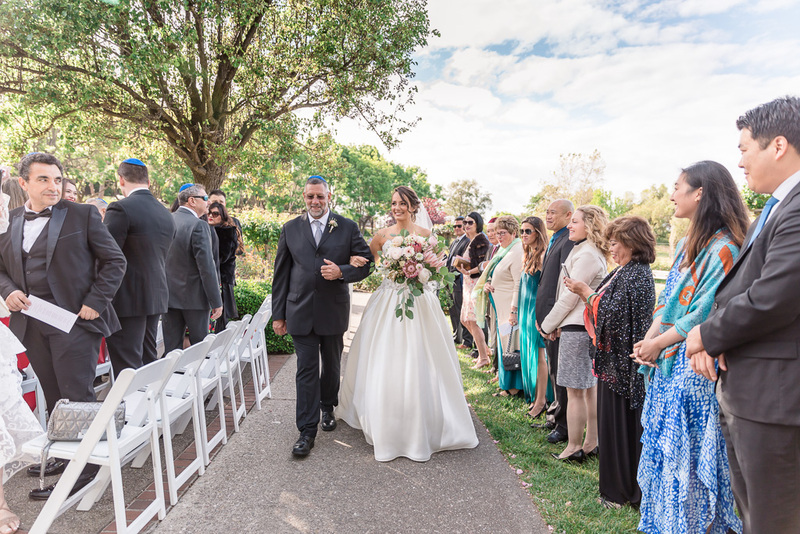 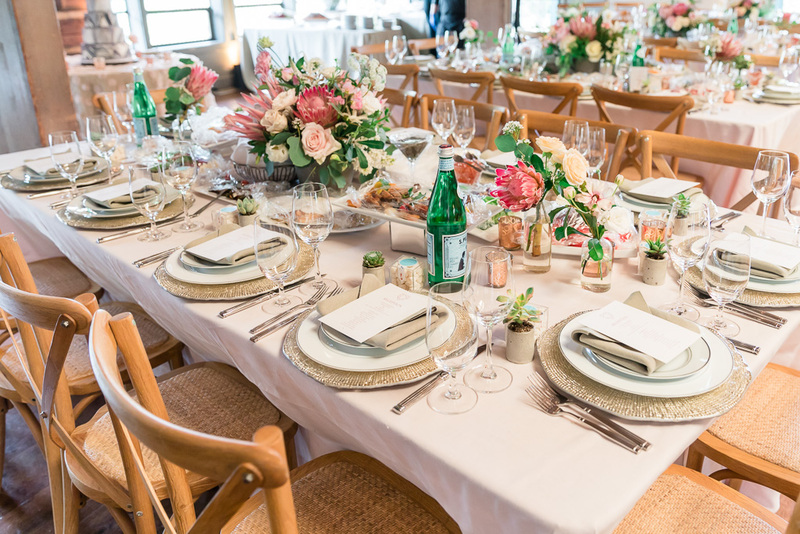 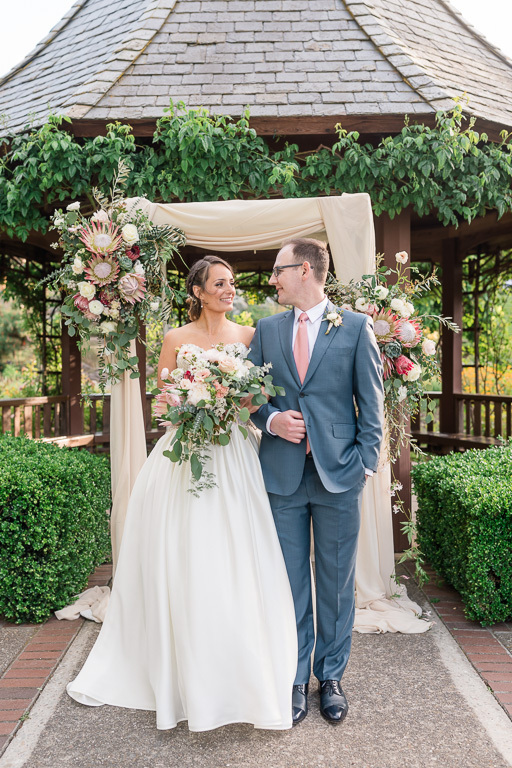 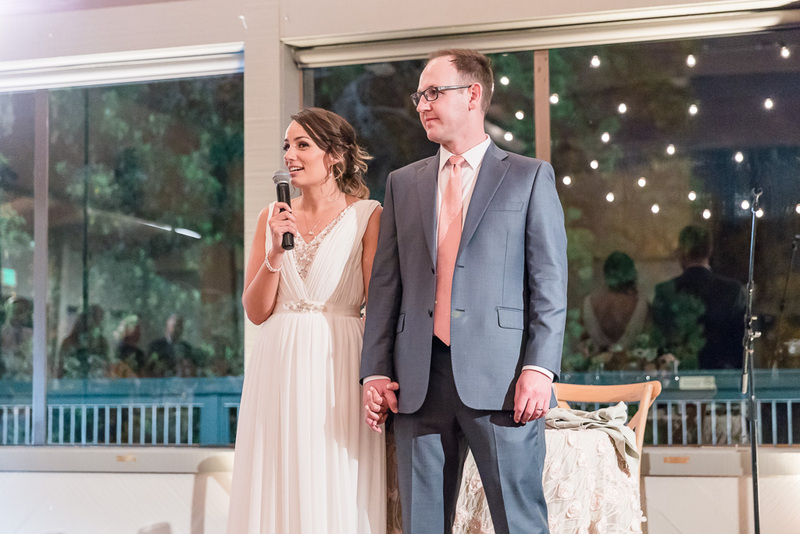 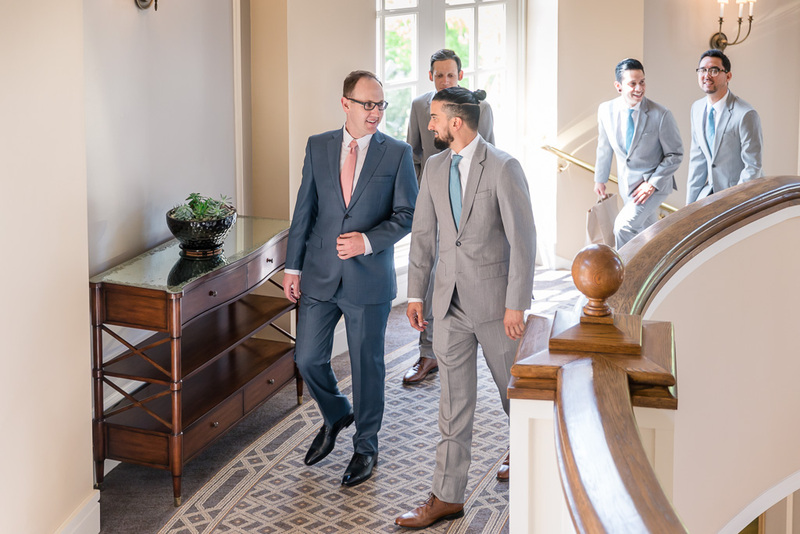 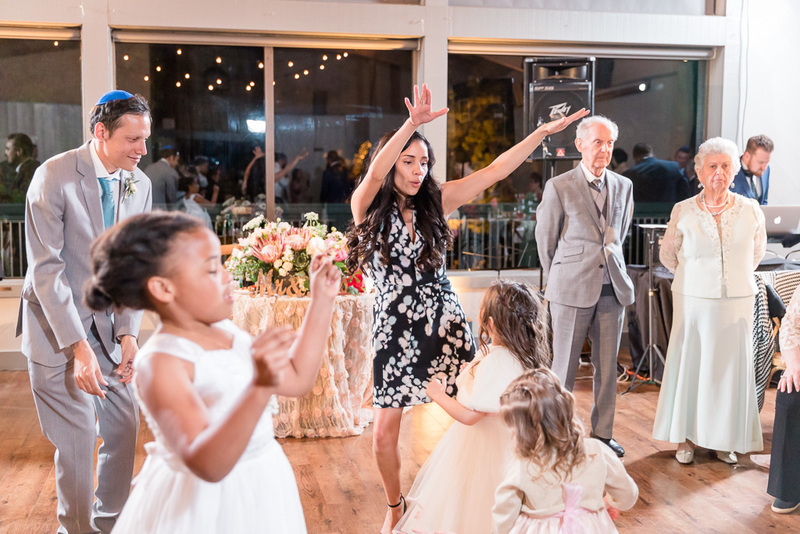 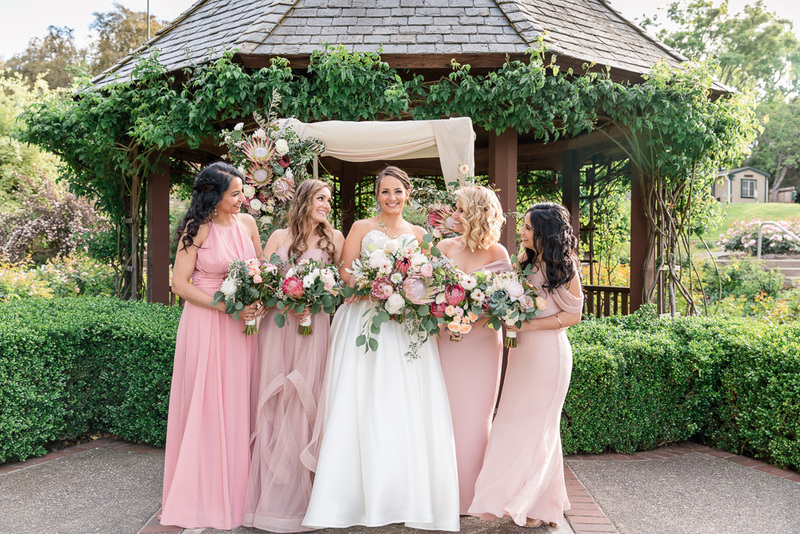 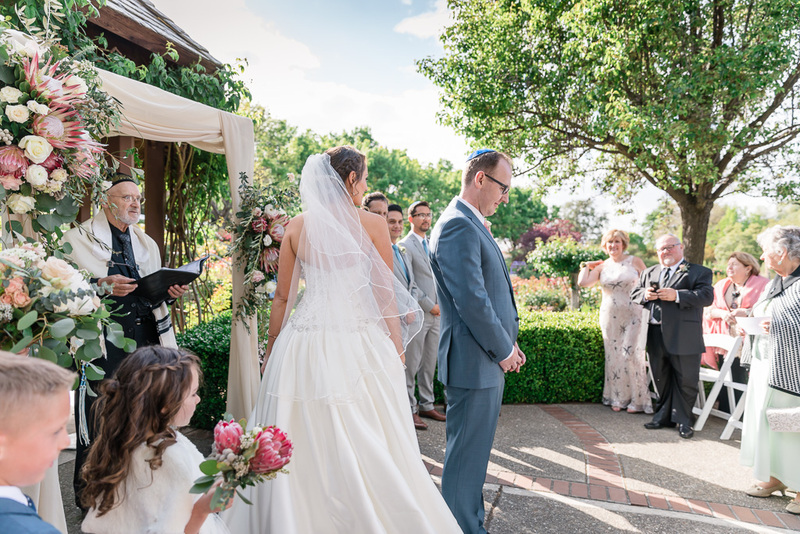 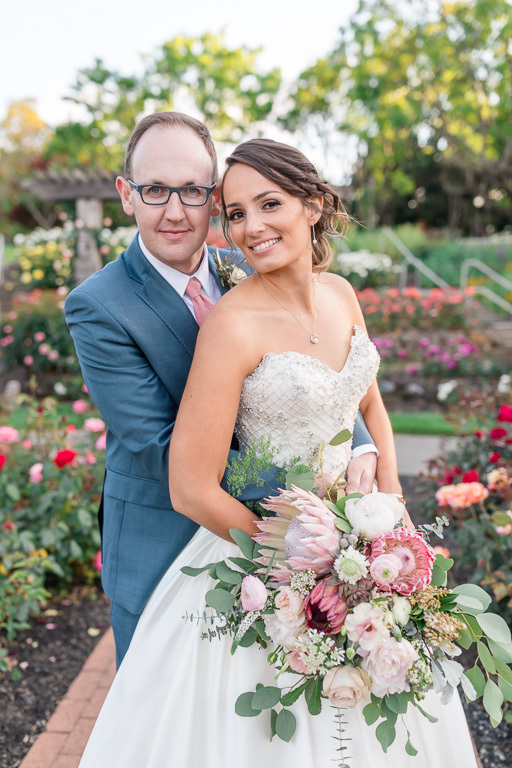 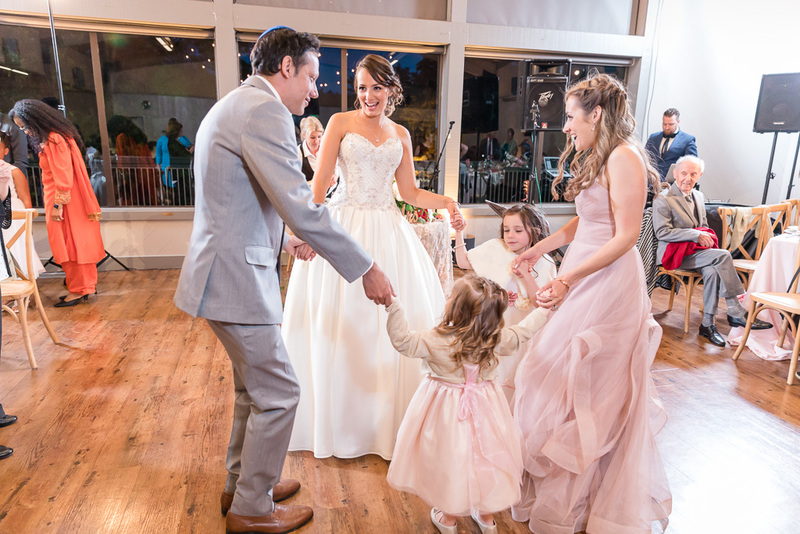 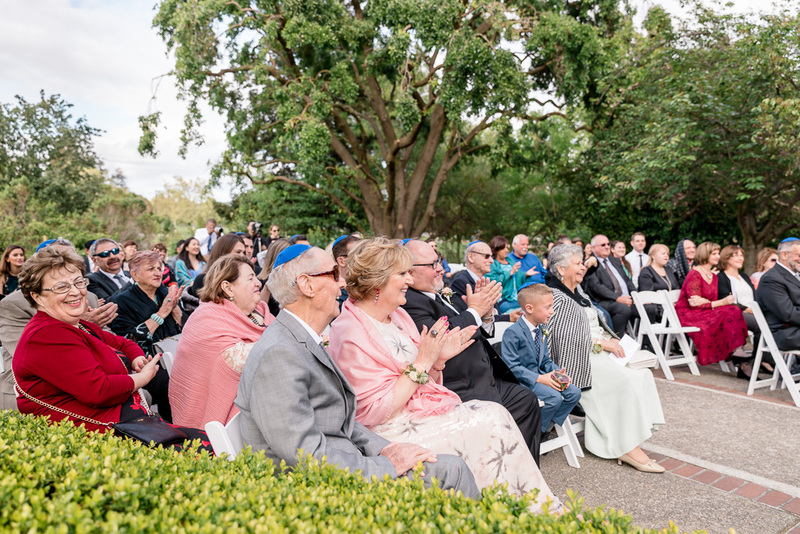 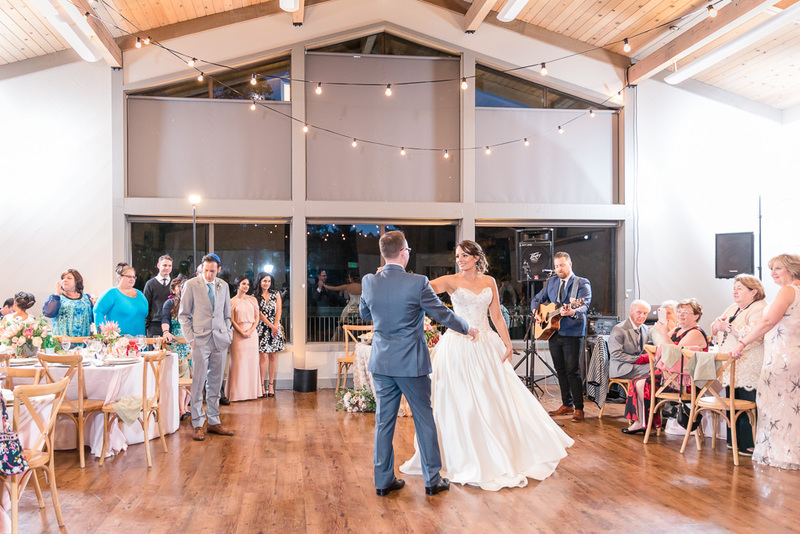 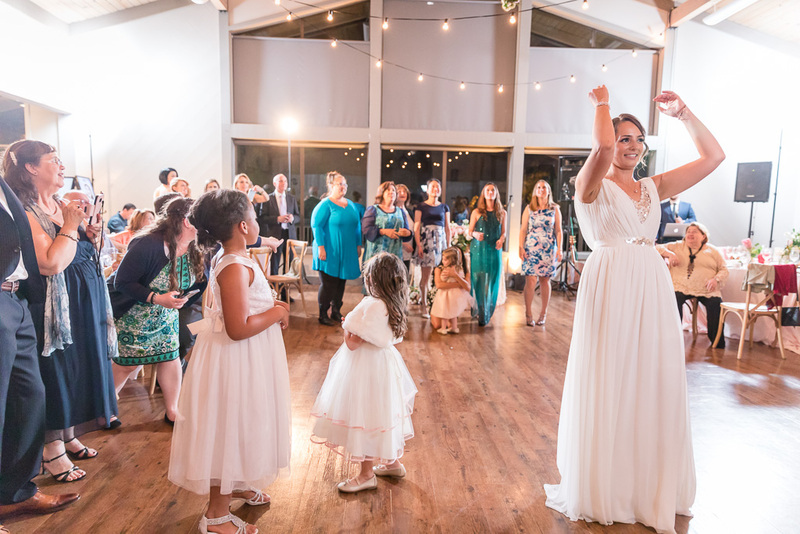 Boris & Genevieve’s guests traveled from the four corners of the globe to join them in celebrating their modern Jewish wedding at The Gardens at Heather Farm. 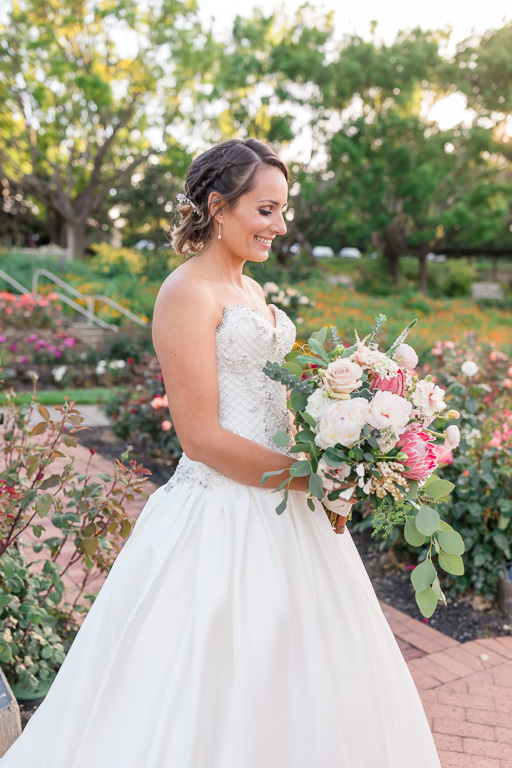 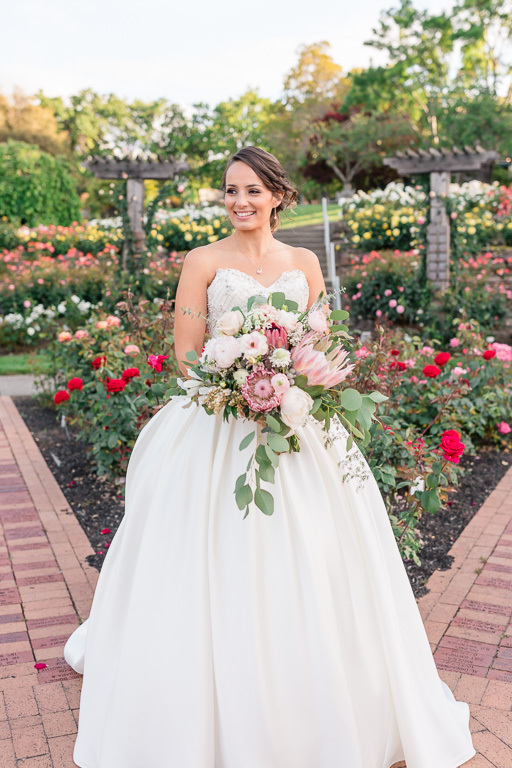 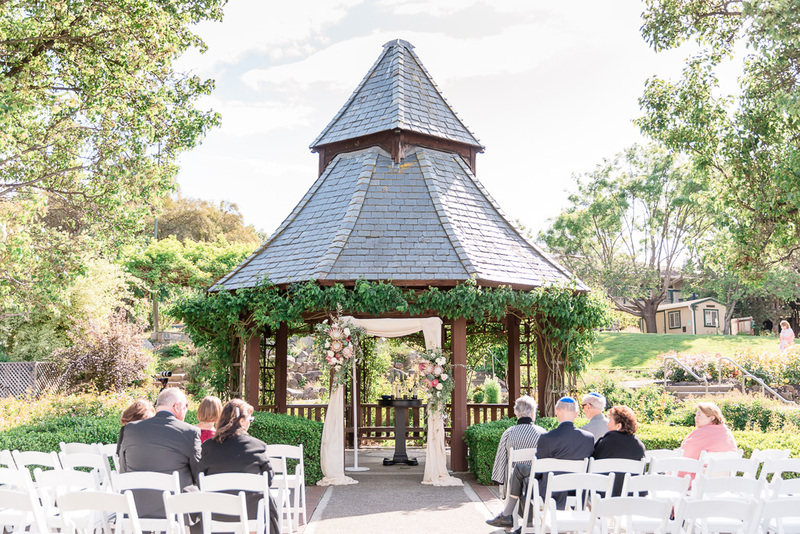 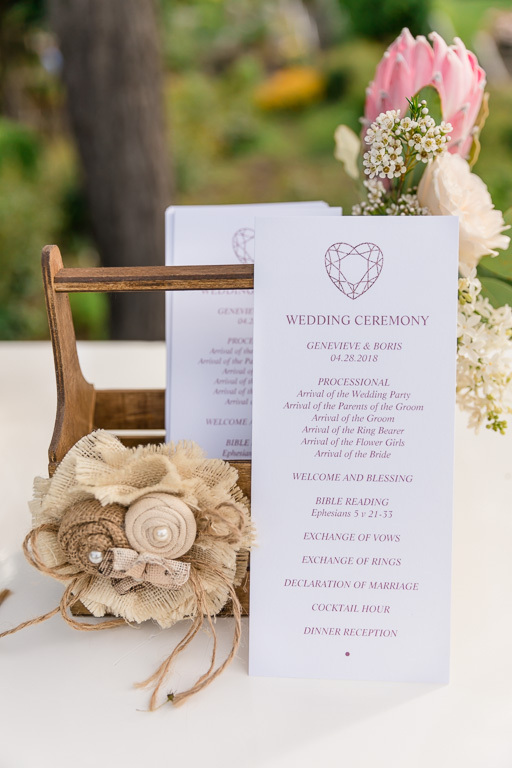 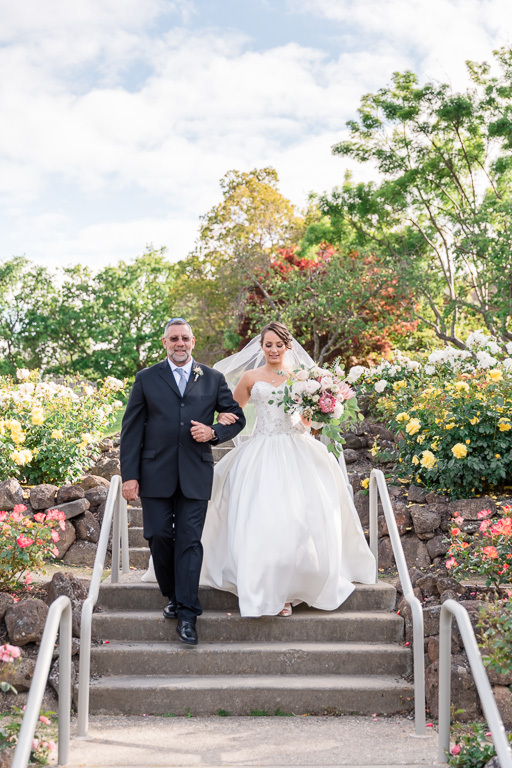 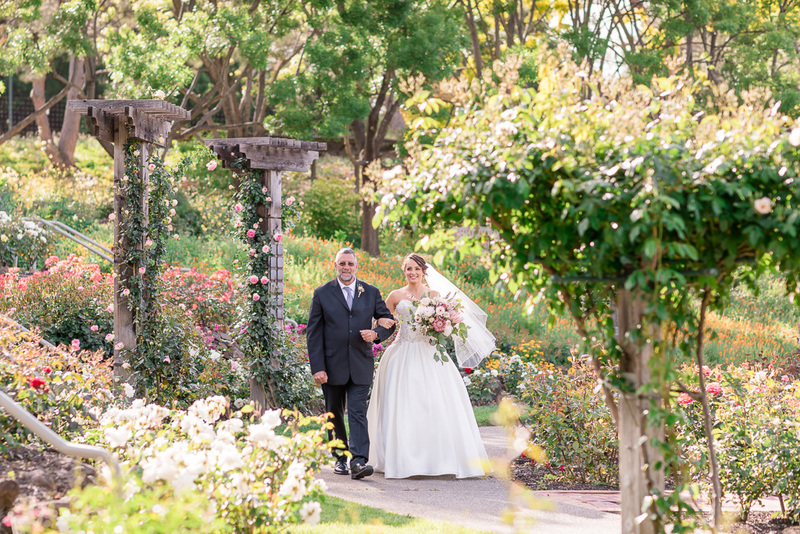 The date was specially chosen to be on Gen’s grandmother’s birthday, and the venue, a non-profit with beautiful roses and a dedication to sustainable gardening, was chosen in memory of her love for gardening and especially for roses. 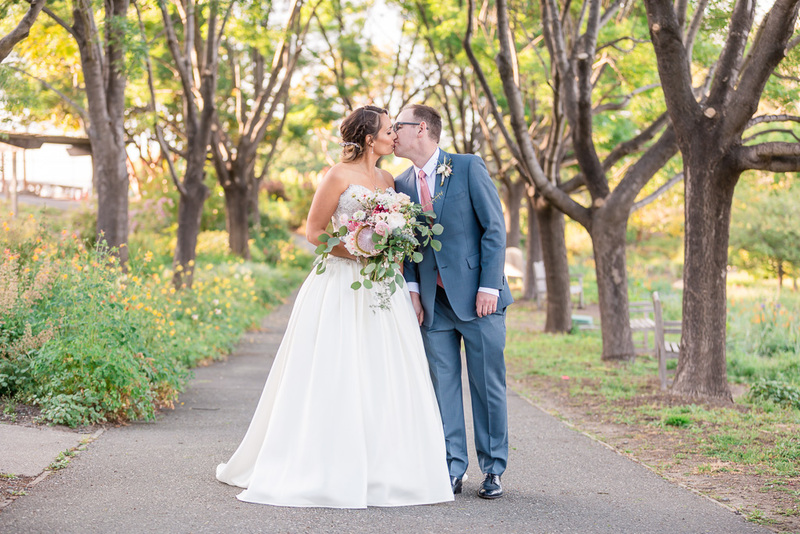 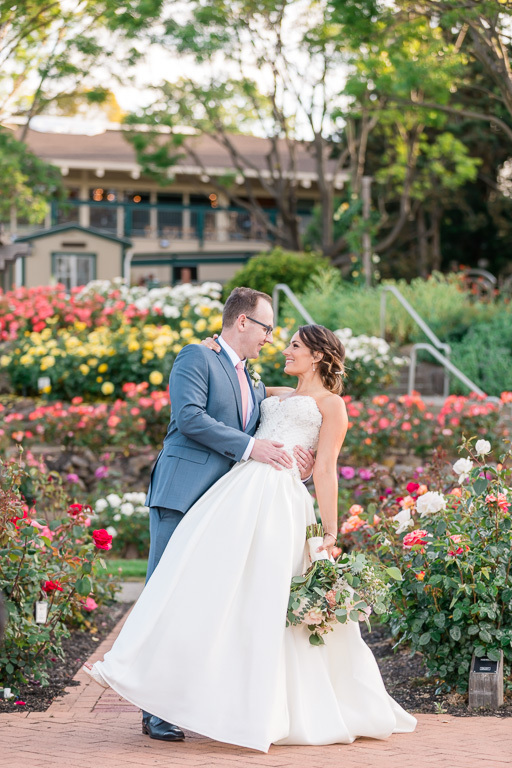 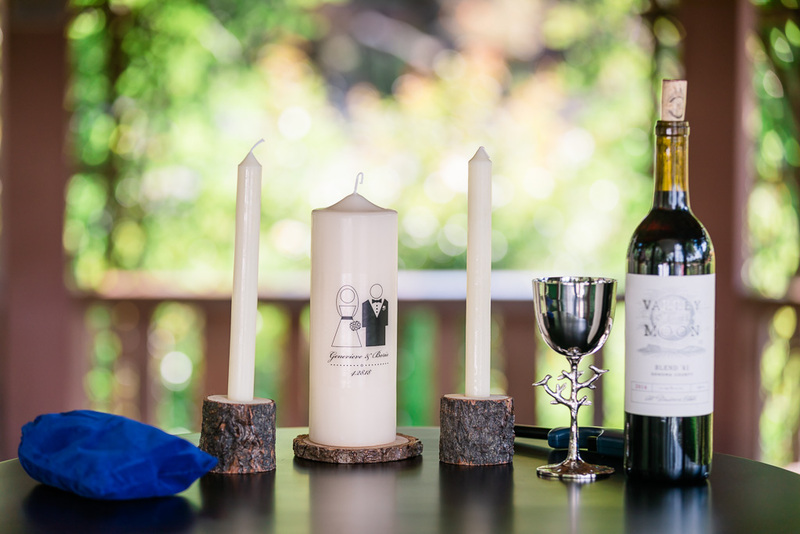 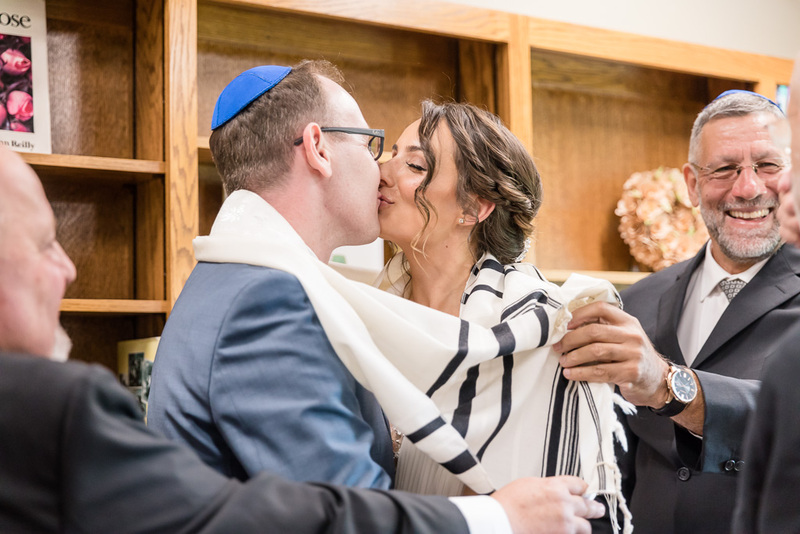 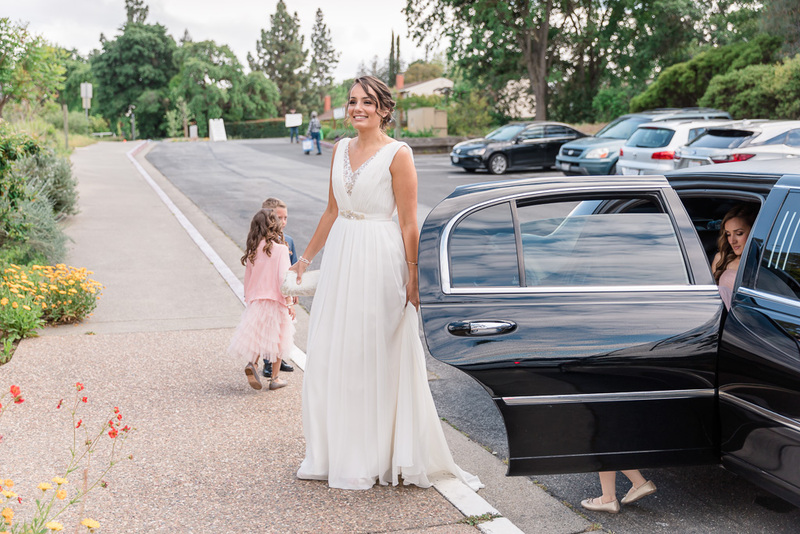 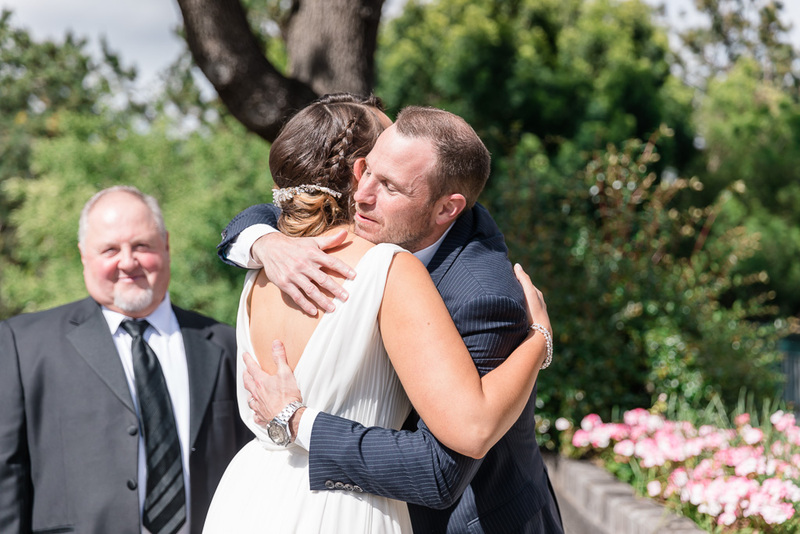 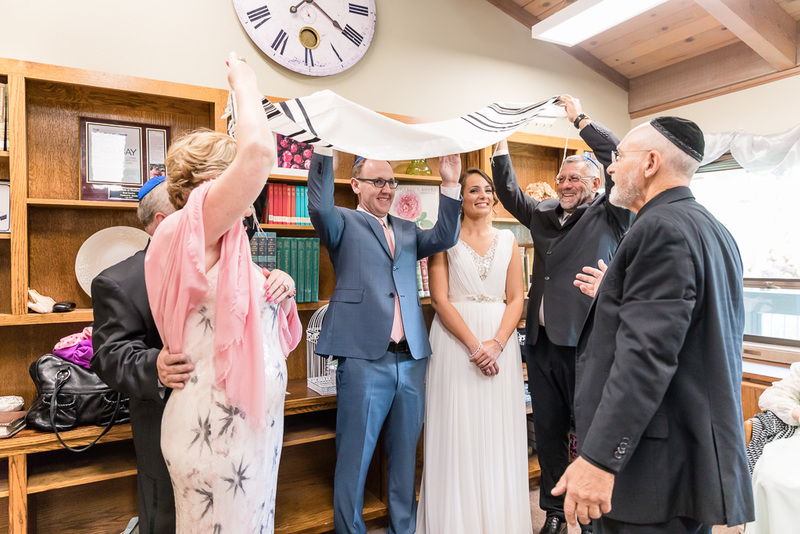 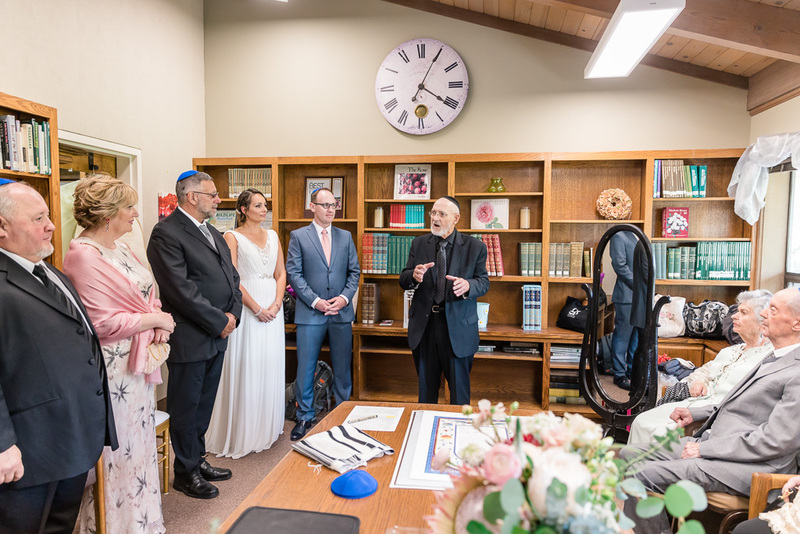 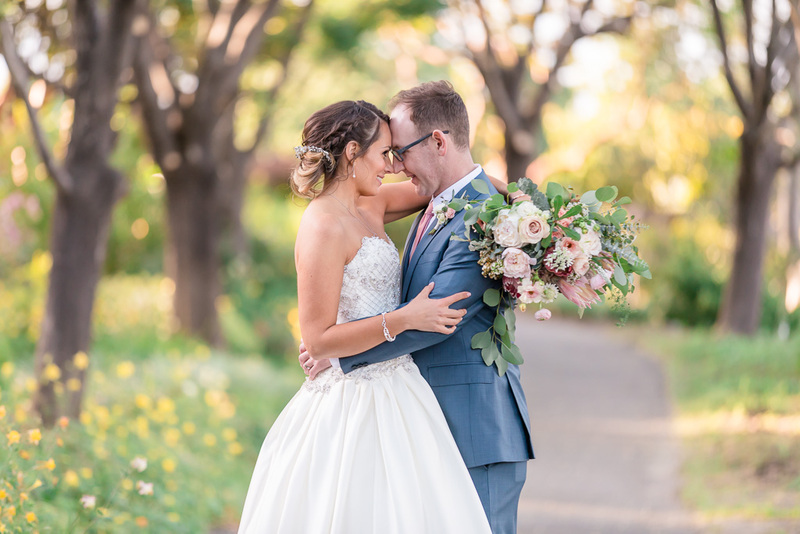 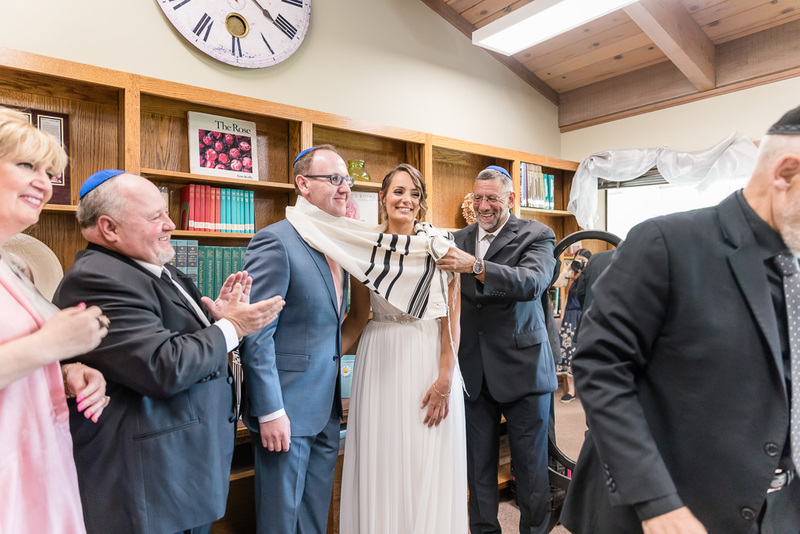 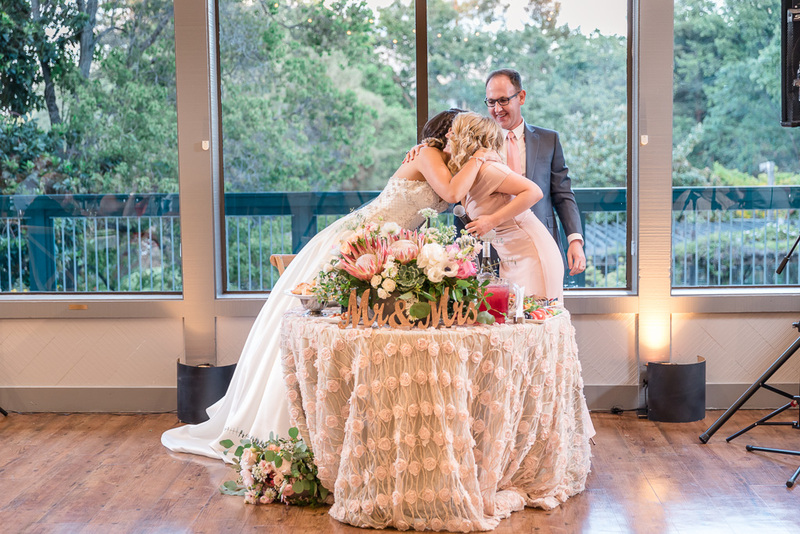 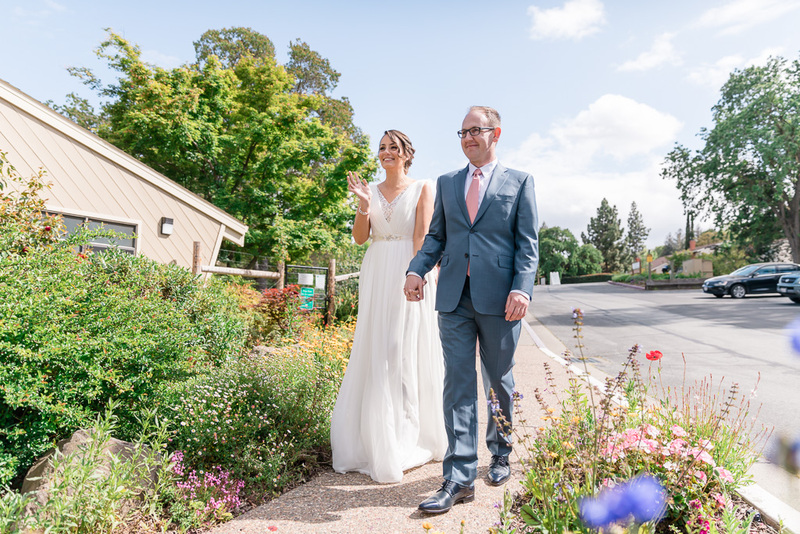 Their wedding started off with a ketubah signing, followed by Gen changing into her wedding gown and then their garden ceremony with all the guests. 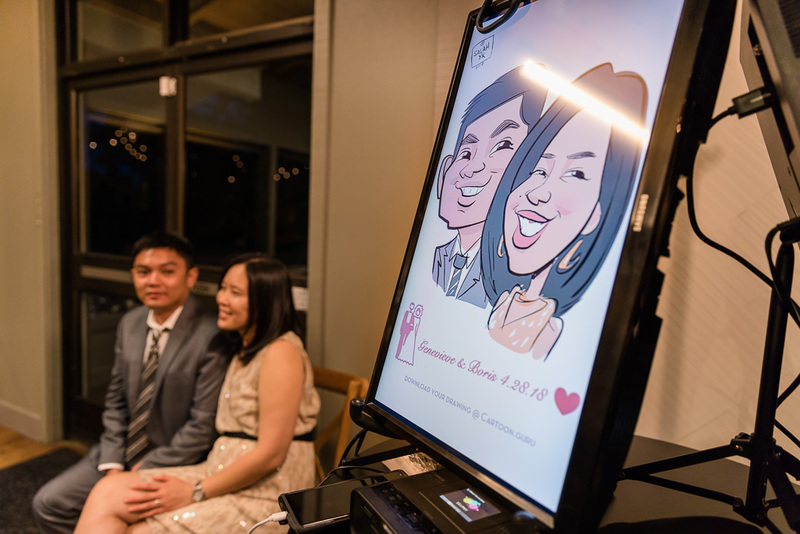 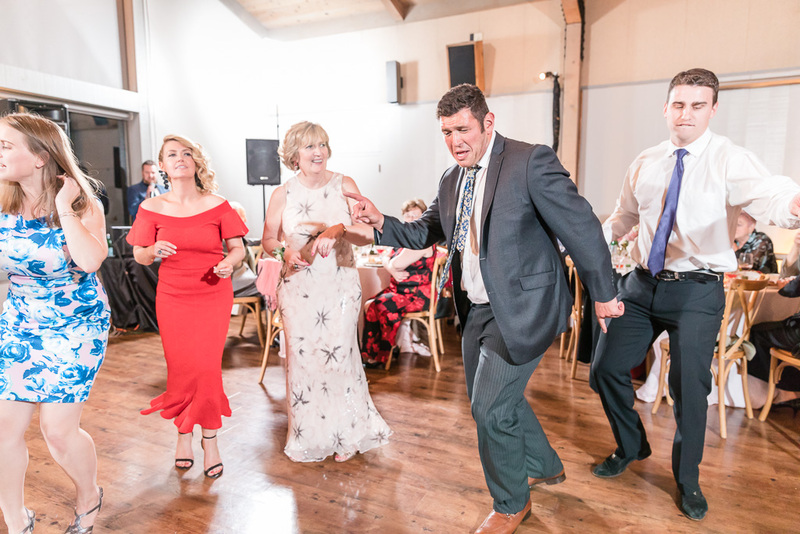 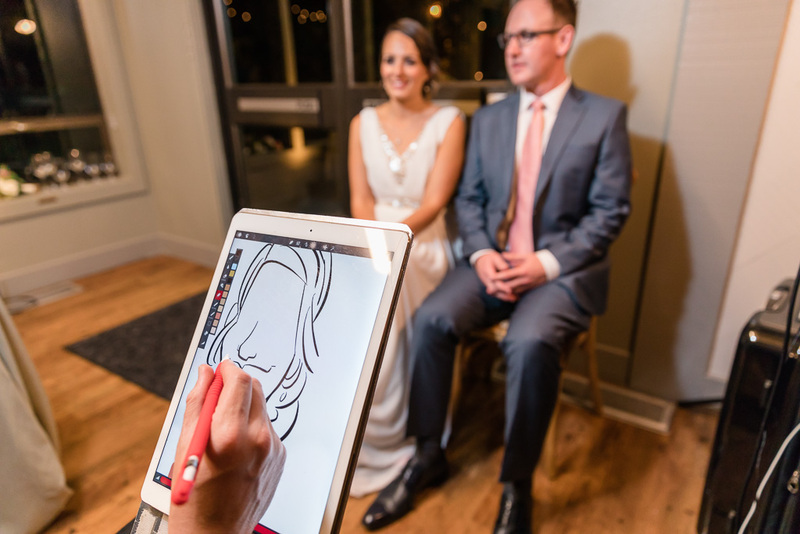 The reception was a lively one, with a pair of cartoonists drawing super well-done caricatures of guests and even the bride & groom (a huge hit, every wedding should have this! 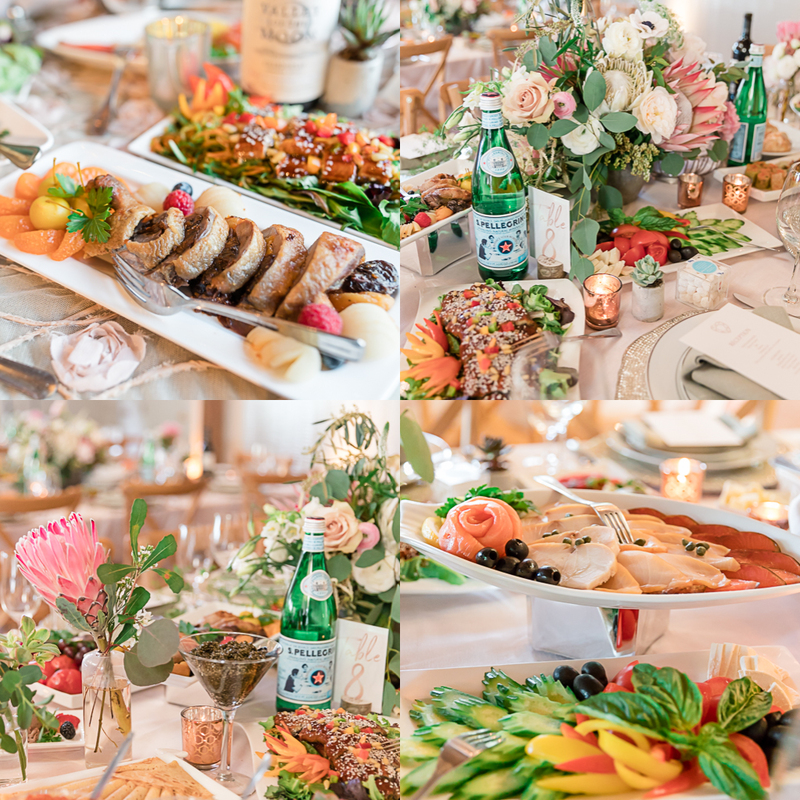 ), many toasts by the family, and an absolute feast of a Russian-style dinner. 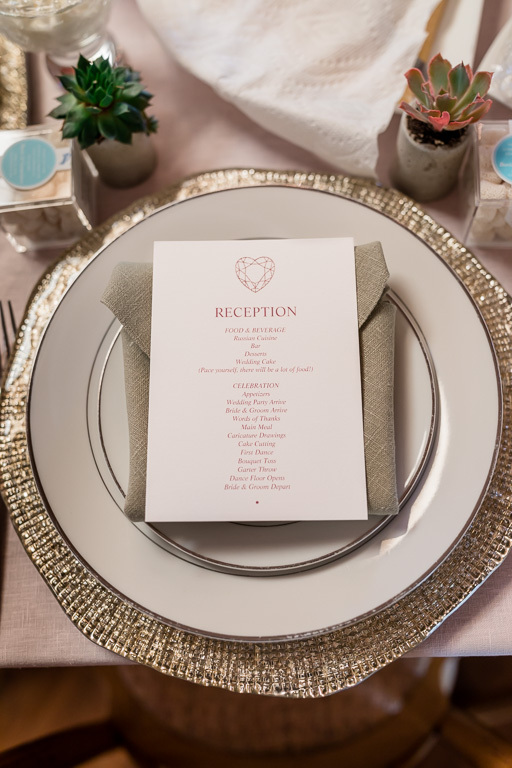 We hadn’t been paying much attention to the meal schedule, so when the main course was being brought out to the guests, we were totally confused — like, there are 30 huge plates on each table and the main course wasn’t already in one of those?! 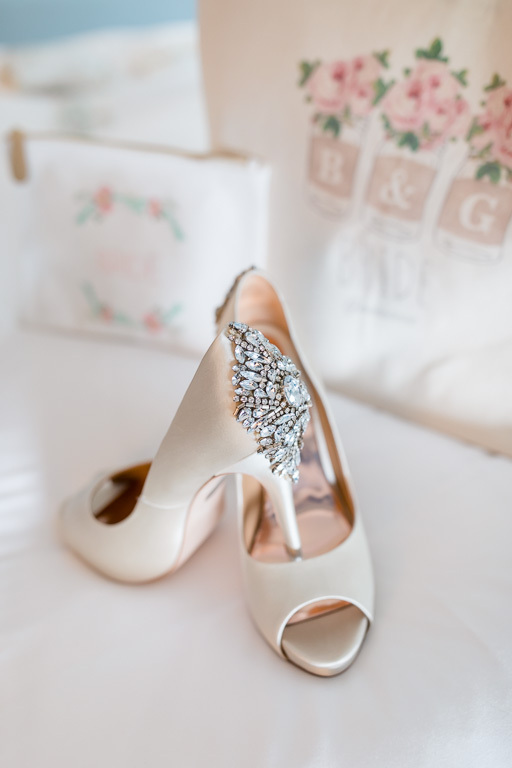 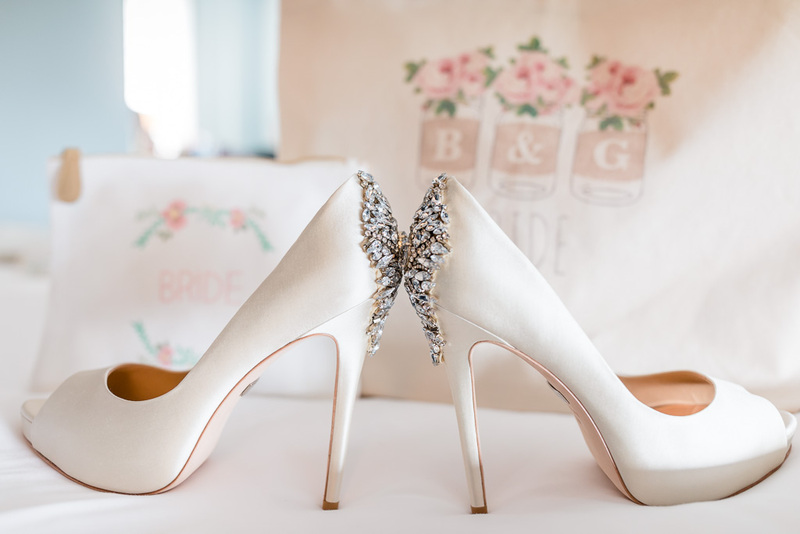 One of the things that really stood out to me about this wedding was the rainbow of details. 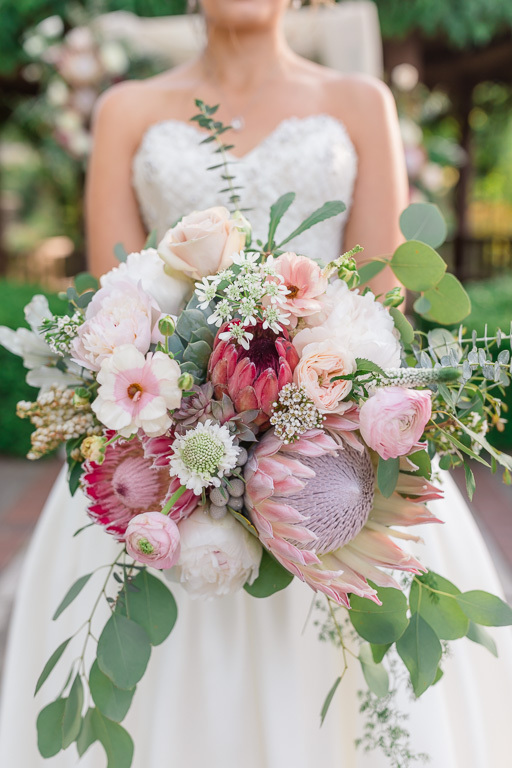 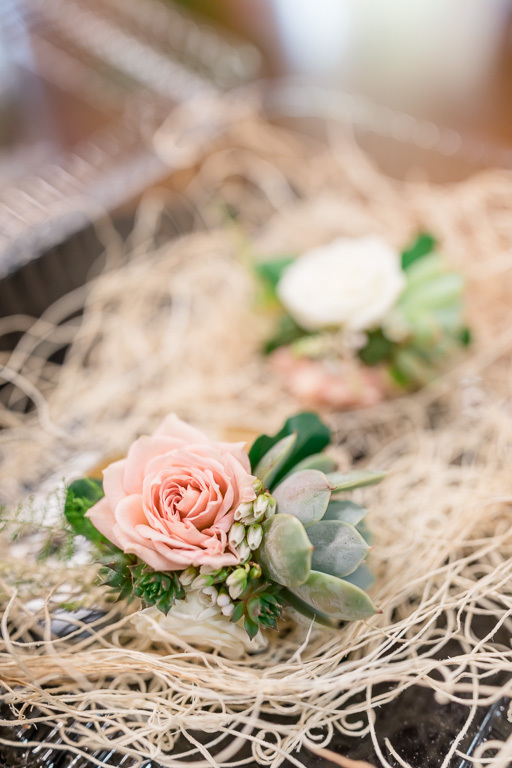 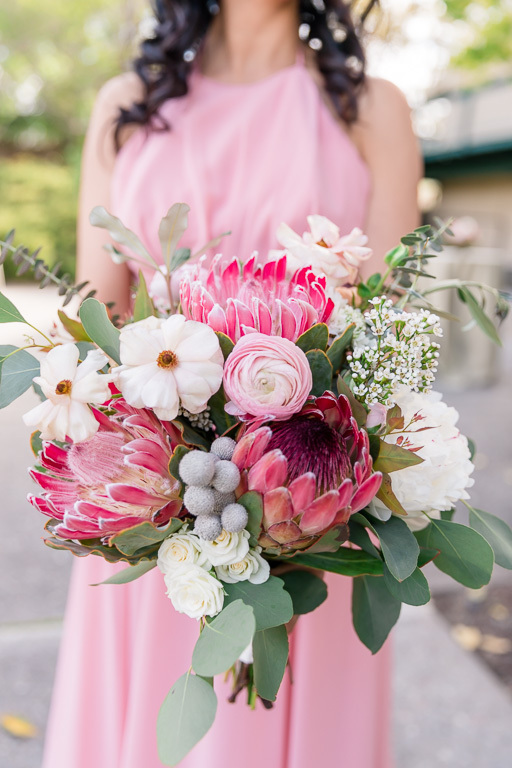 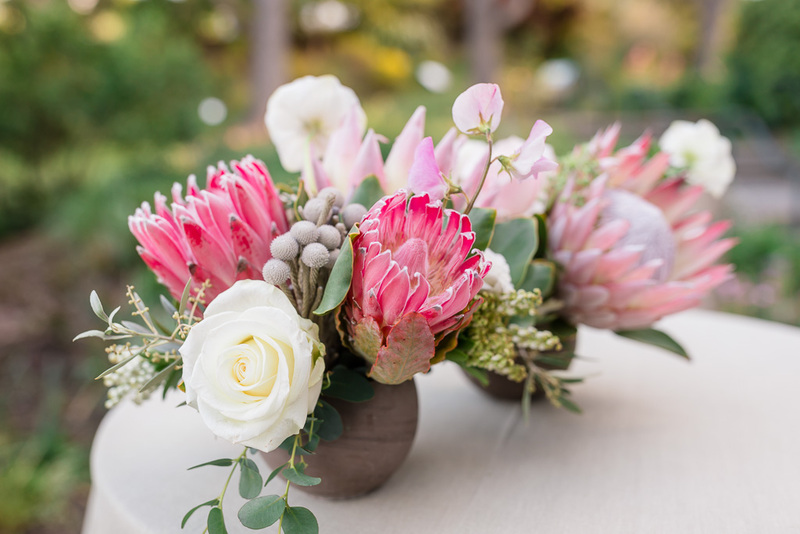 The blush bridesmaids’ dresses, elegant boutonnieres, vibrant bouquets, lush florals (especially the big proteas! 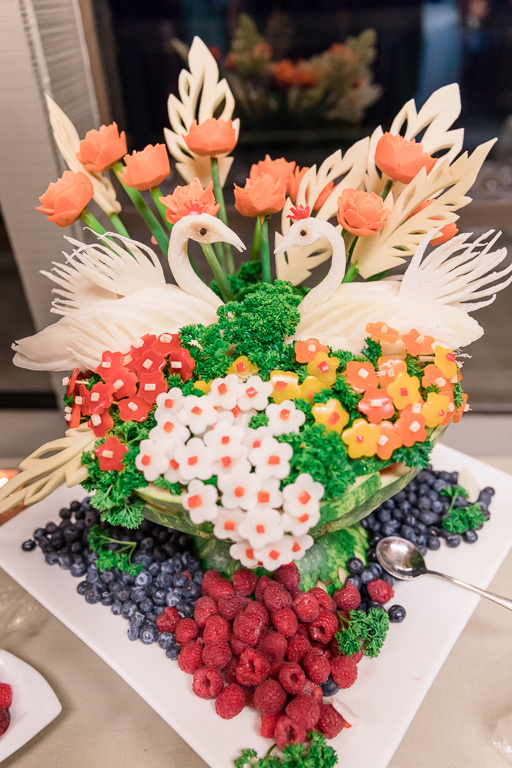 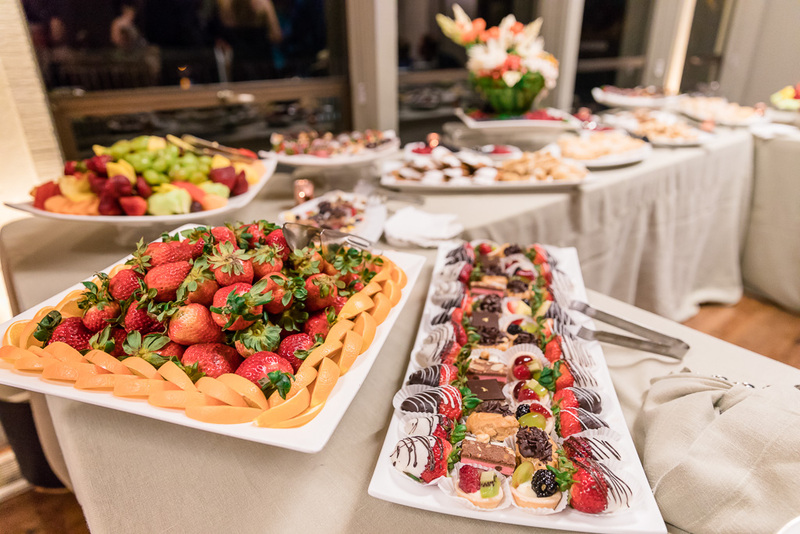 ), and carefully-presented dinner all came together to give this event a bold, colorful theme, and it was like dessert for our cameras! 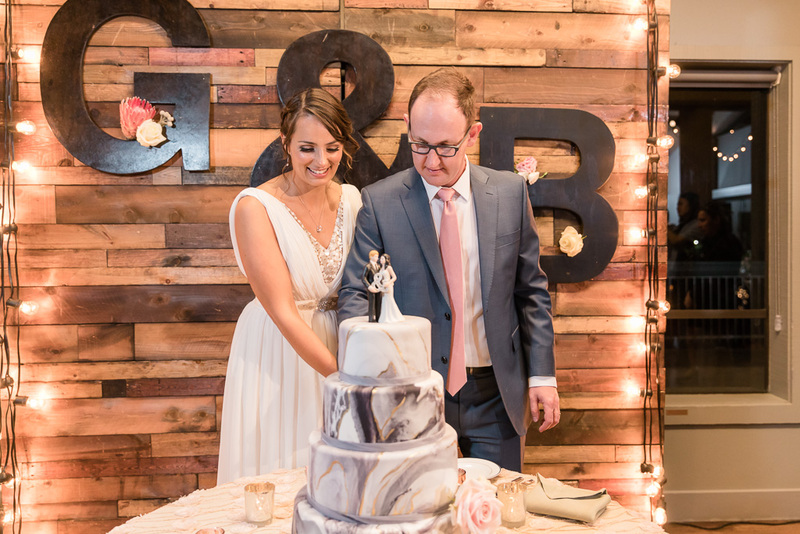 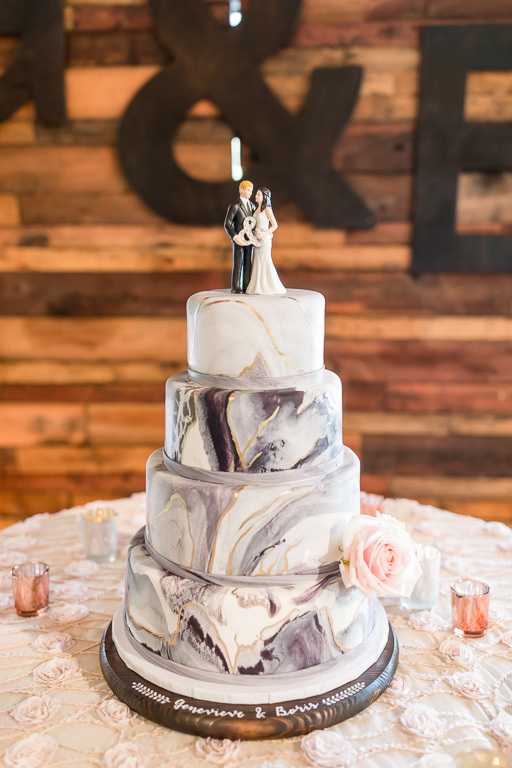 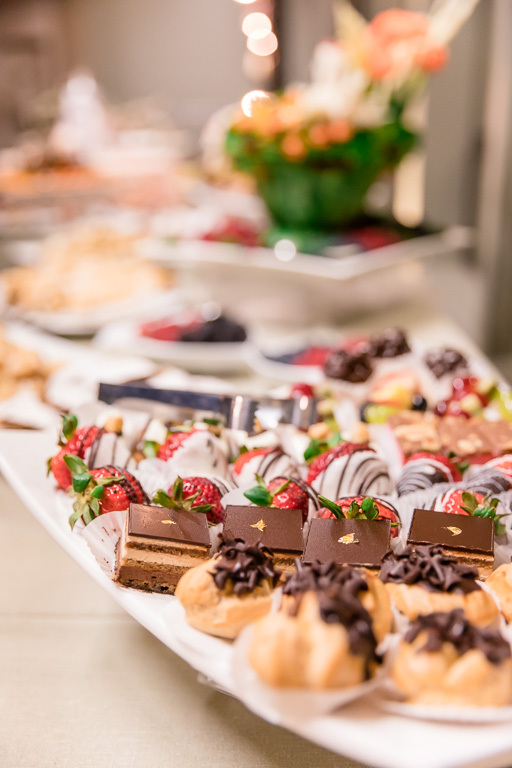 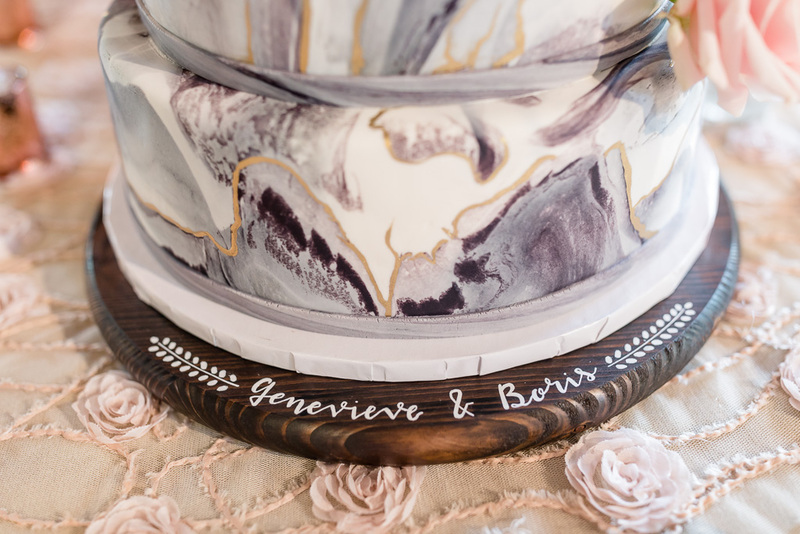 And speaking of dessert… yes, their marbled wedding cake and the rest of the dessert looked amazing as well. 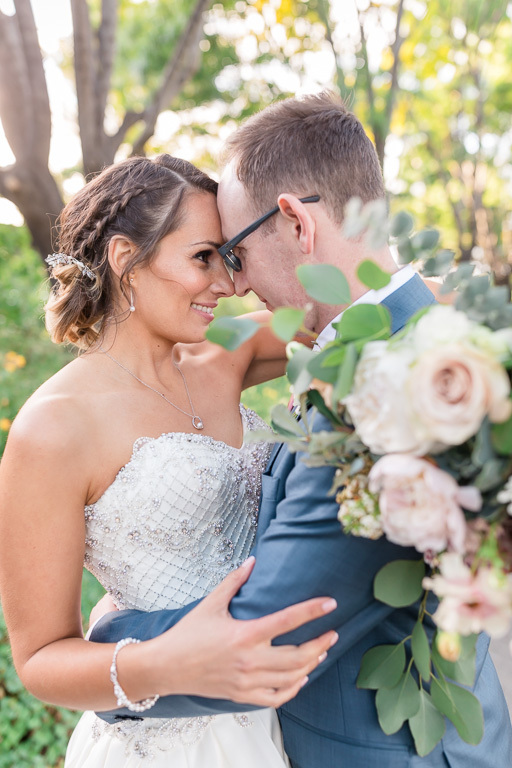 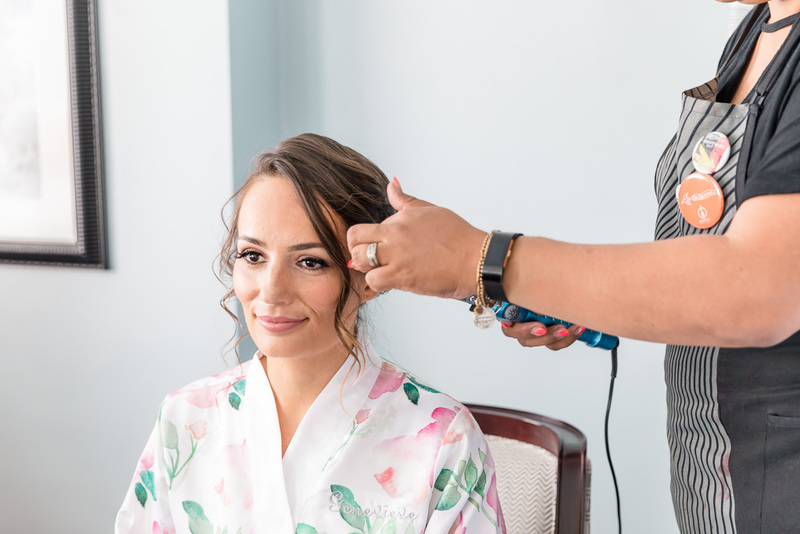 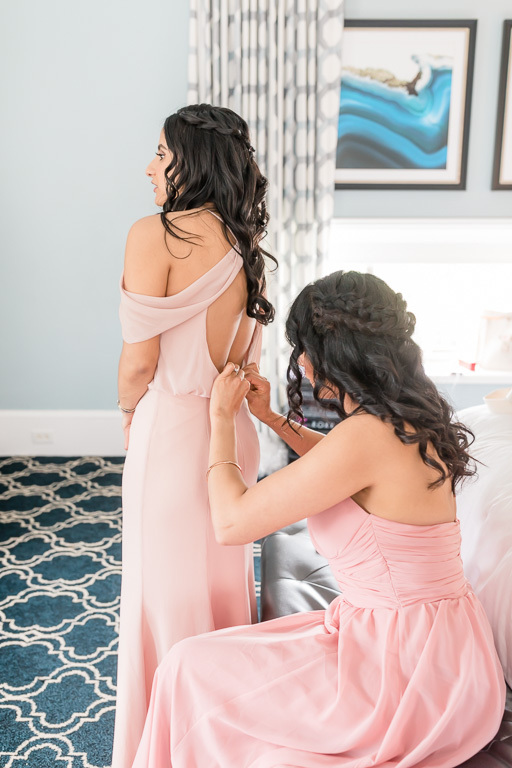 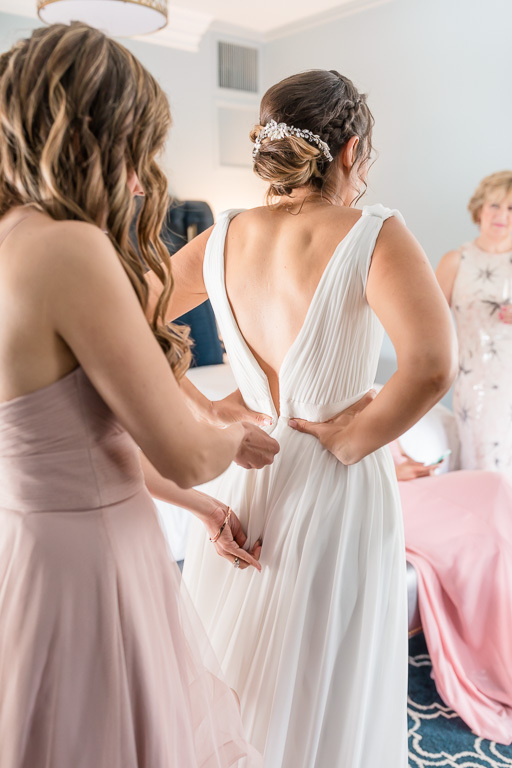 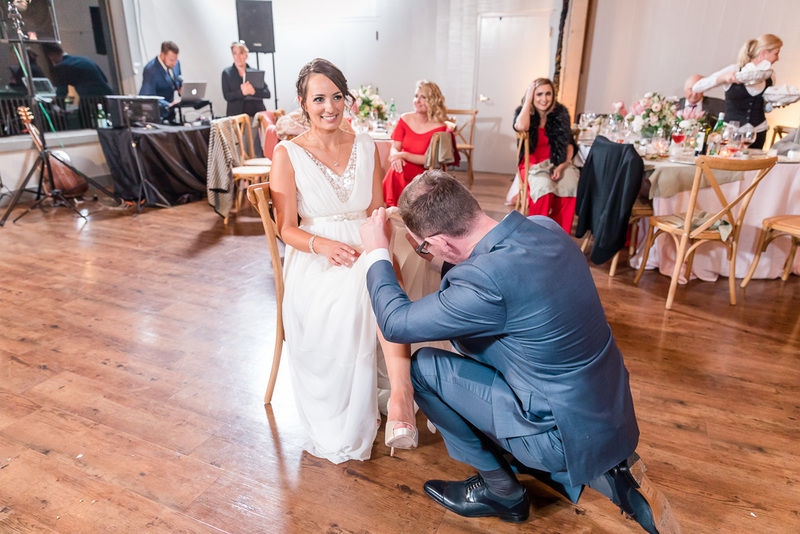 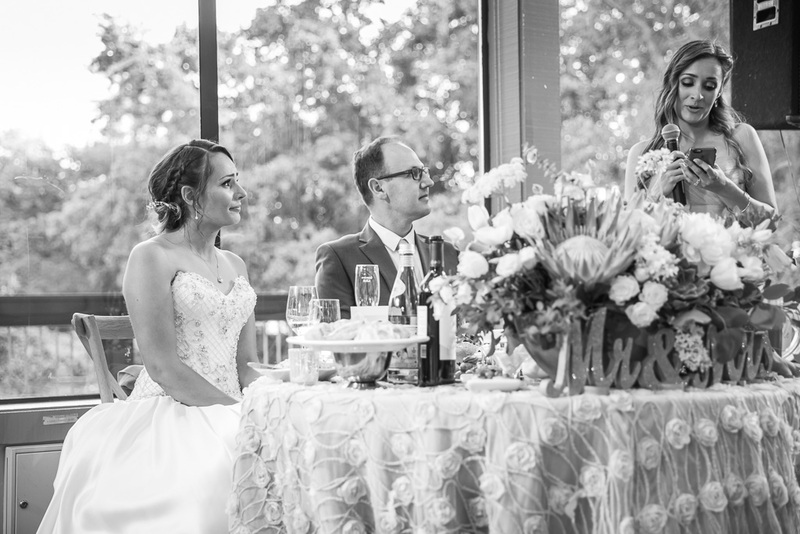 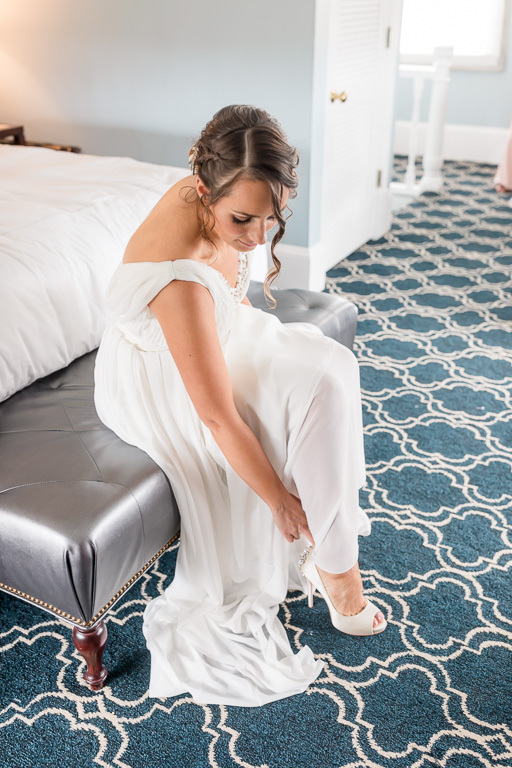 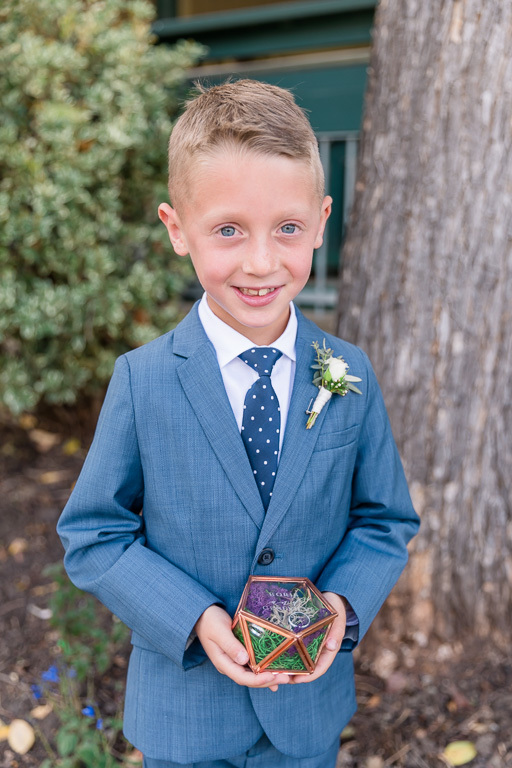 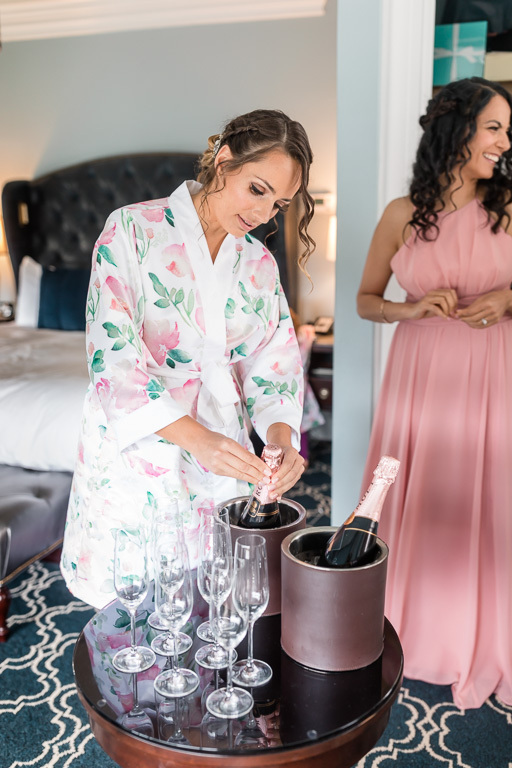 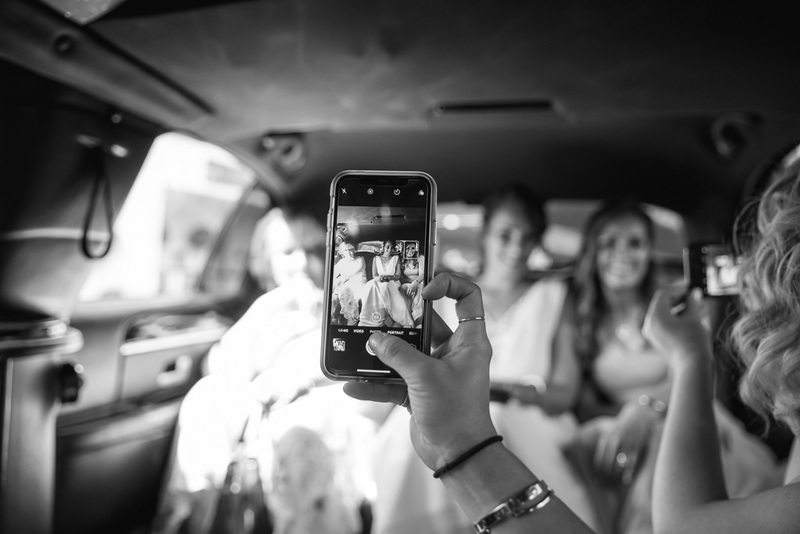 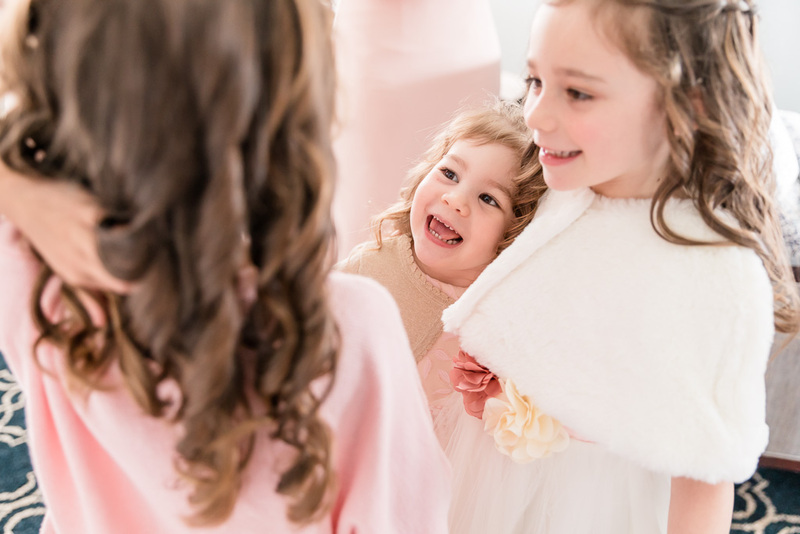 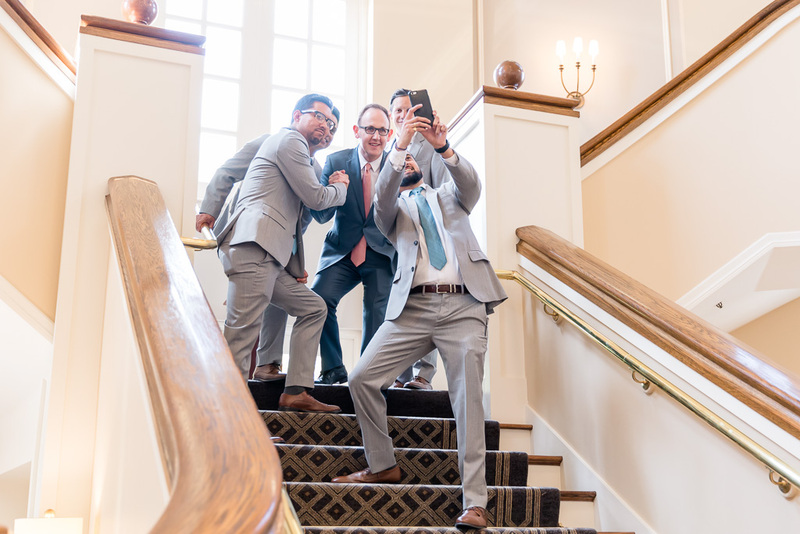 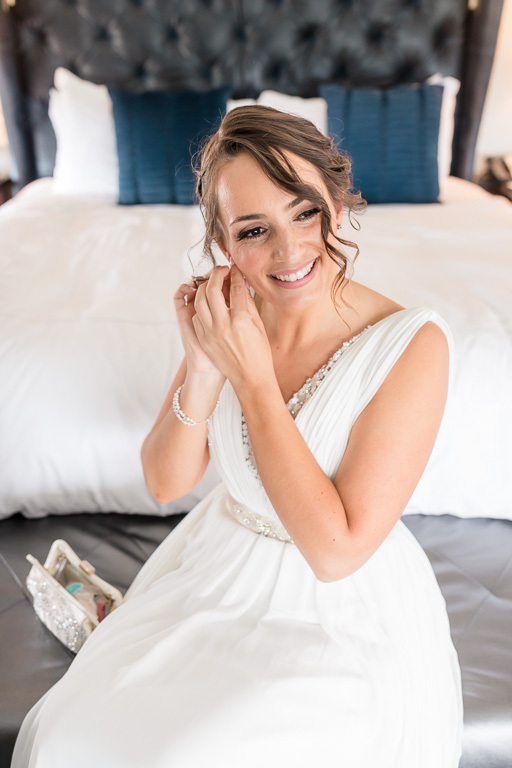 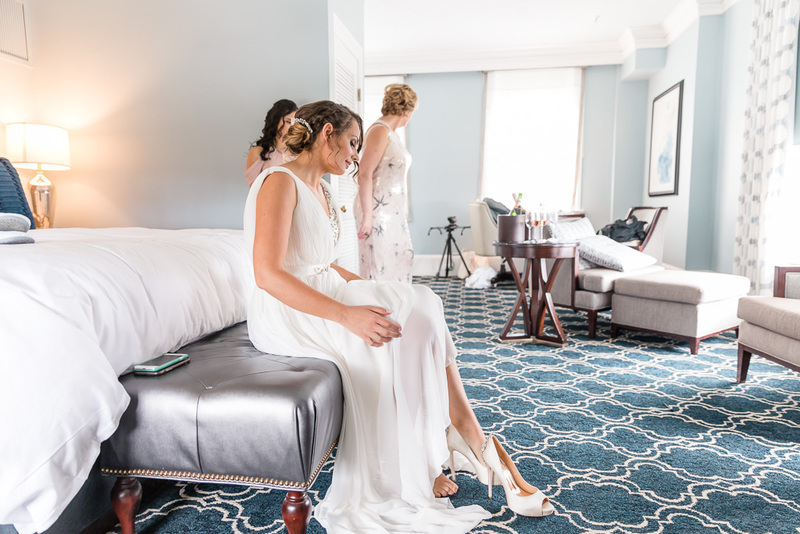 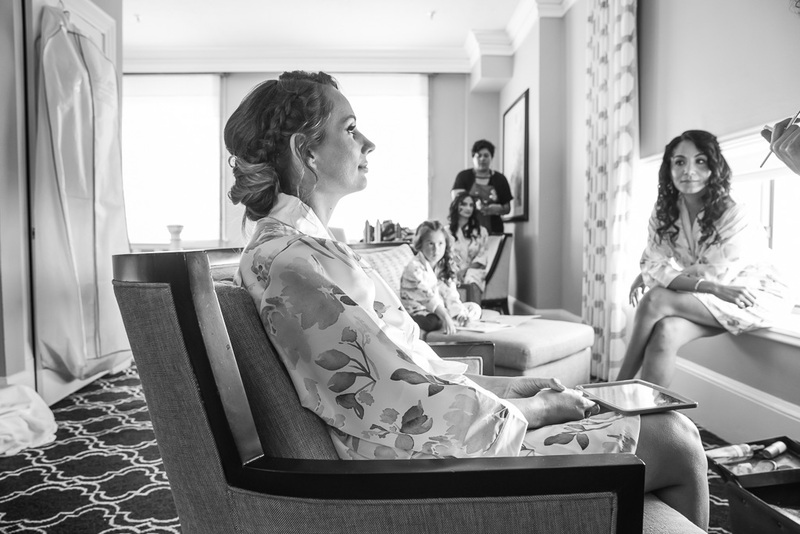 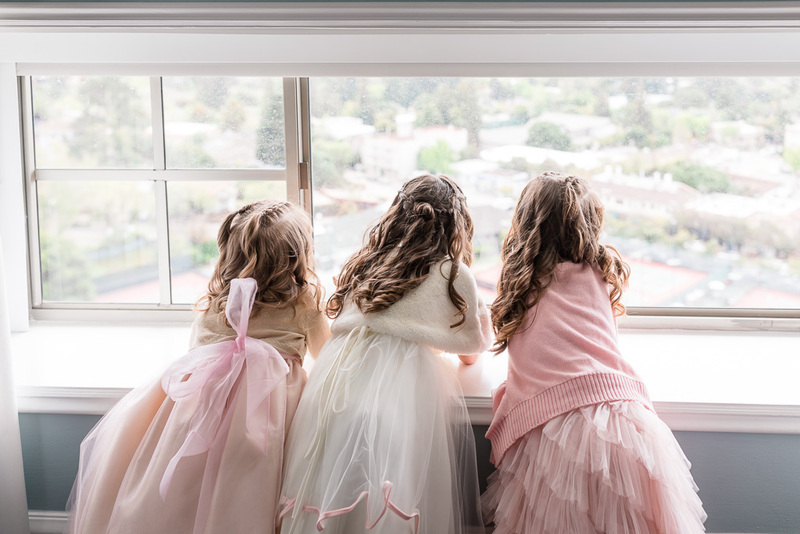 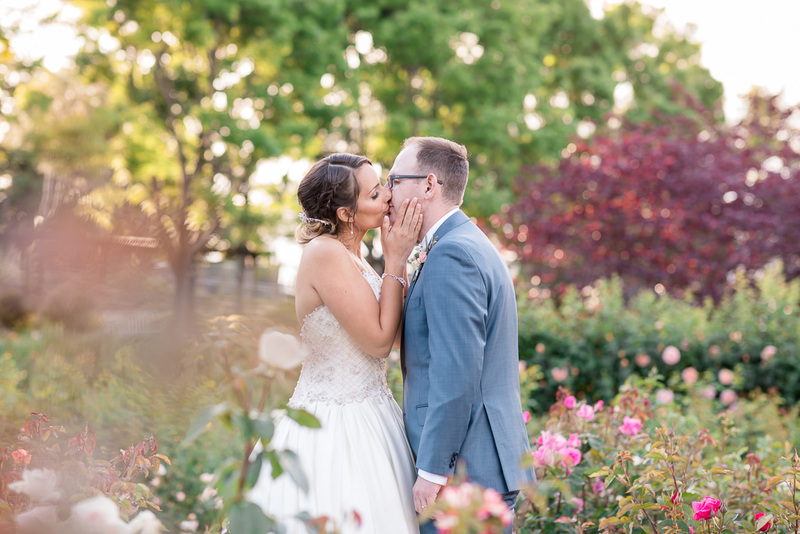 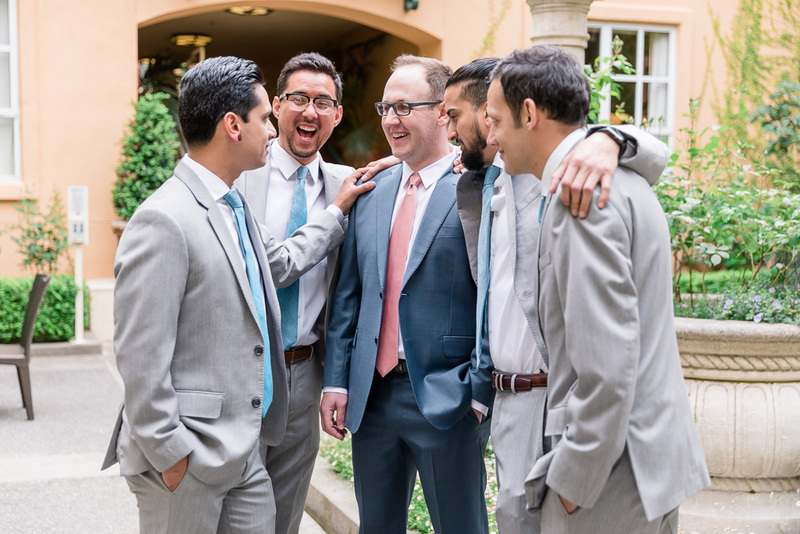 We loved all the personal touches and details, and capturing all the moments was a joy. 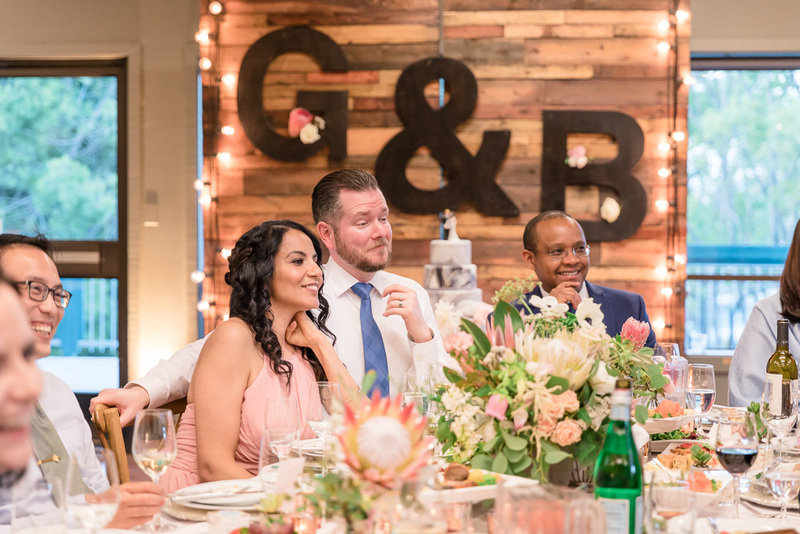 One last thing before I leave you with the photos: Boris is mostly pretty reserved, but just look at the way he looks at Gen 🙂 Congrats to this happy couple, and take a look at their wedding below! 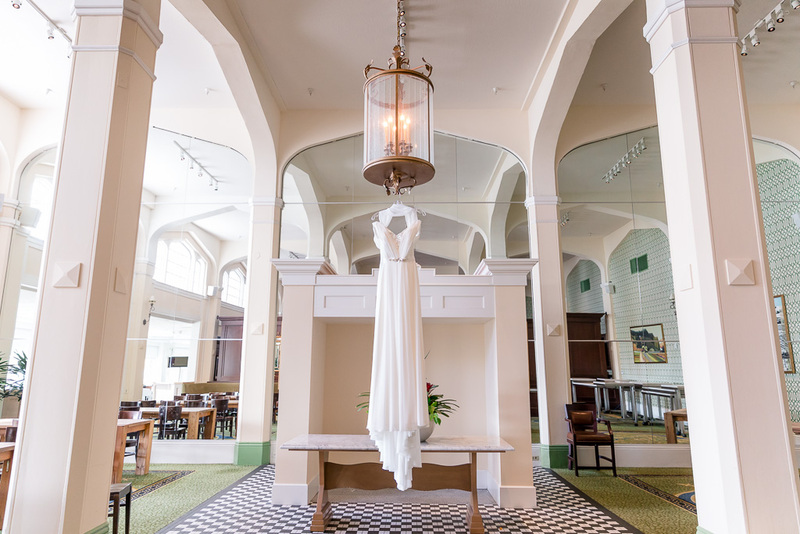 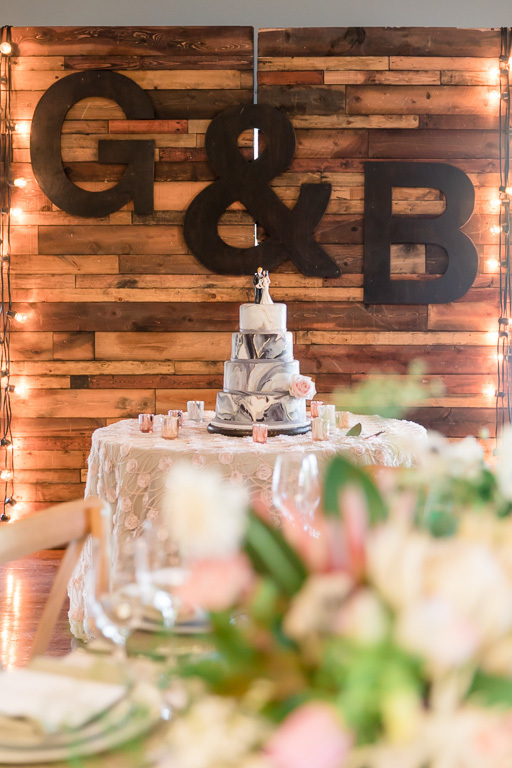 Thanks to all the vendors who helped make G&B’s wedding day perfect!